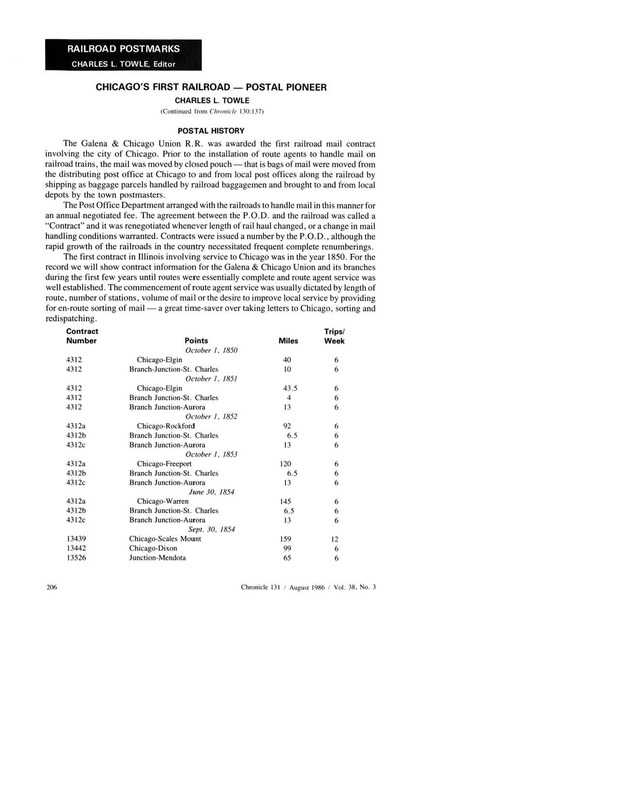 In 1984, the City of West Chicago Historical Museum in West Chicago, Illinois, published "A Brief History of an Old Railroad Town: An Updated Review of West Chicago" by Frank F. Scobey and Gerald D. Musich. In order to share the history of West Chicago with a wider audience, West Chicago City Museum (formerly known as West Chicago Historical Museum) will release an enhanced digital version of Scobey's book, chapter by chapter. 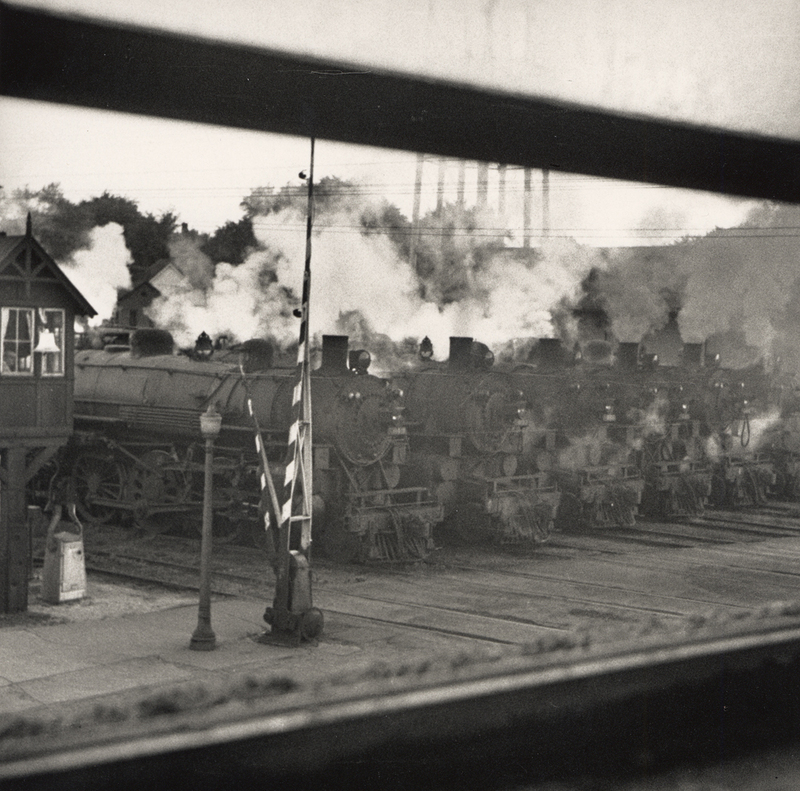 ..And so it came to pass in the year of 1849 that from the belching smoke of the Iron Horse came the breath of life to a new entity in Illinois – a railroad community. The ten-ton Pioneer, a wood-burning locomotive has the distinction of creating a new and successful railroad era in the Fox River Valley and in Illinois. 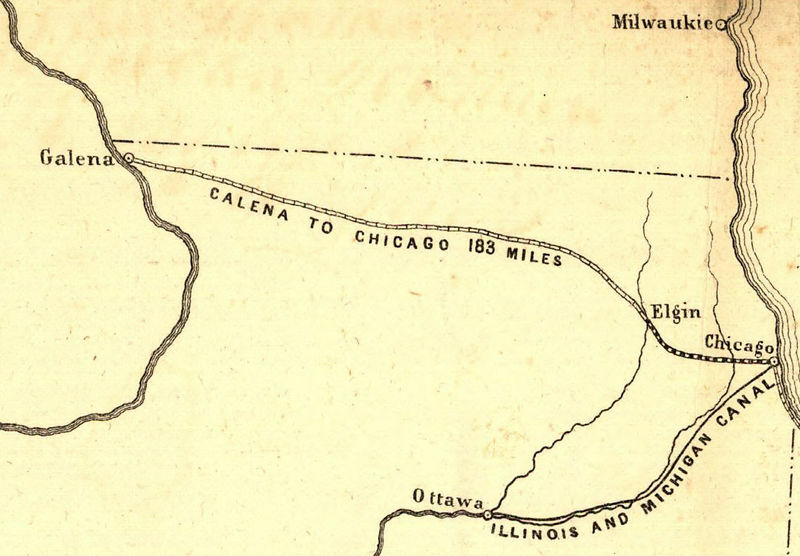 With the selection of a railroad junction point here, other branch lines sprouted out to join the main line of the Galena and Chicago Union Railroad. The directors and officials of the booming Galena Road ordered a westward extension from here. Soon after railroad repair and maintenance facilities were built, and Junction became an important and busy railroad center, with trains arriving from all directions. The railroad companies prospered and Junction or Turner Junction increased in population and development. By 1857 two townsites were platted – the Town of Junction and the Town of Turner, but no one in those far-off years made any attempt to petition the Illinois State Legislature for a special act giving the community a corporation status. Also, Fredrick Lagger, John H. Lakey, James McGraw, Norman Nellis, John C. Neltnor, Joseph A. Norris, Calvin K. Sanders, William Simmons, Joseph W. Smith, Edgar Stephens, Morris L. Town, James B. Trull, Casper Voll, Emory B. Watson, Frederick Weger, John West, Frank Whitton, Albert H. Wiant, Joel Wiant, Dr. William J. Wilson and Walter S. Wilson. The area of the proposed village comprised 645 acres, located in parts of Sections 3, 4, 9, and 10. It absorbed the Original Plat (John B. Turner's Town of Junction) and Joseph McConnell's Town of Turner, and also the Atcherson's, Church's, Heslop's, Rolling Mill, Updike's and Winslow's Additions and James B. Trull's Subdivision, now the site of Calvary Cemetery. 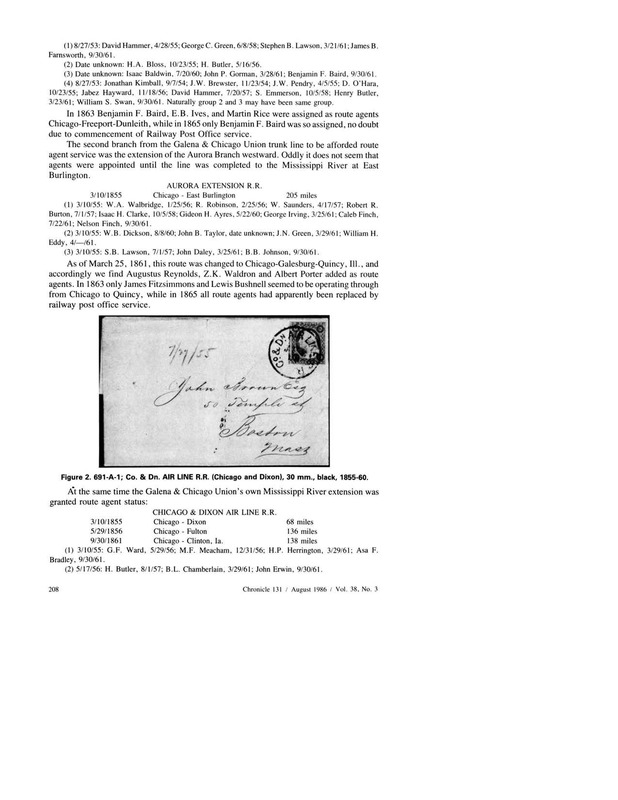 Charles M. Clark, a highly respected local resident, presented the signed petition for incorporation to Judge Myron C. Dudley of the DuPage County Court, and it was entered of record for May 8, 1873. Judge Dudley ordered that the question of village organization be submitted to the legal residents of the proposed Village of Turner and set Saturday, May 31, 1873 as the election day, with due notices to be posted. 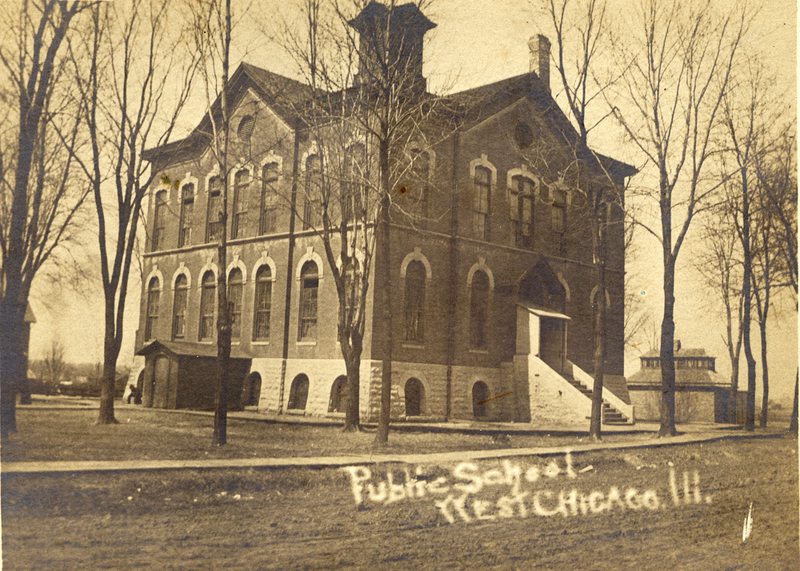 The election took place at the one-time North Side-Washington School. In the June 5th court proceedings, a statement of the result of the election showed that 79 voted for village organization, while 46 voted against it, with a total of 125 voters casting their ballots. The majority for village incorporation was 33. Judge Dudley further ordered that a special election be held here on July 8 for the purpose of electing six village trustees. The election held at the school house resulted in Capt. Lucius B. Church, Casper Voll, Albert H. Wiant, Lyman C. Clark, Frank Whitton and Henry Bradley being elected as Turner's first board of trustees. At the first board meeting on July 12, it was decreed “That the Seal of the Village shall have as a design a Locomotive Engine surrounded by the words Village of Turner Incorporated July 12, 1873.” Sometime in the 1950's the present City Seal, designed by Tom Fawell, came into use, and the locomotive design is testimony of West Chicago's unique railroad ancestry. ...And so it came to pass another petition – one for a name change – was presented to the Turner village council at a meeting held on January 4, 1896 at the Town Hall. The 187 petitioners gave no reason for wanting to drop the village name of Turner in favor of West Chicago. Meeting no opposition the full village board adopted the name change on January 25, 1896, and a part of history gave way to progress. ...And so it came to pass that the proposition of reorganizing under a city charter was on a ballot at the village election of April 18, 1905. The results were challenged and after conflicting legal opinions and extended court hearings, the case was finally settled by the Illinois Supreme Court. A new election was held on August 22, 1906, and by a favorable vote of 210 to 104 West Chicago obtained a city charter, after the first one was voted down in 1894. ...And so it came to pass the year of 1973 was observed as the Centennial of West Chicago's Incorporation. Every community, larger or small, has its share of history and progress in the passage of a century, and West Chicago's part was told in the first edition of this publication, printed in 1973 as a commemorative booklet. ...And so it came to pass that, with the growing interest in the community's history and its museums, the City of West Chicago offered to publish a new edition of the publication while similar to the 1973 edition in format all the old chapters have been revised by Jerry Musich of the City of West Chicago Historical Museum and me to bring them current to 1984 and several new chapters have been added. 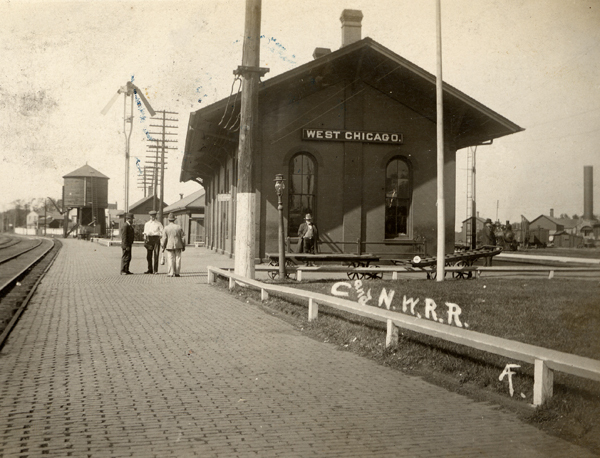 West Chicago is the first Illinois community created by the coming of the railroads. 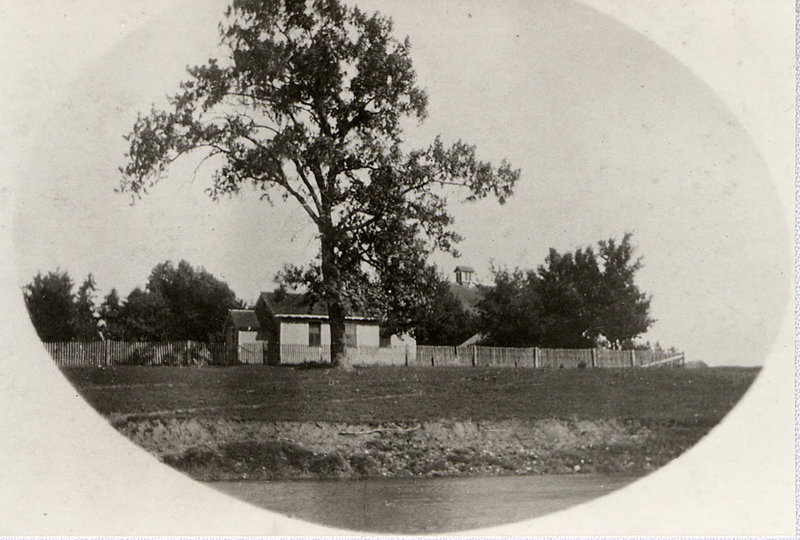 A few settlers owned property in the area of present-day West Chicago as early as the late 1830s. However, the town itself did not begin to form until 1849-1850, when the tracks of the new Galena & Chicago Union Railroad reached this area. Because several railroads were the principal cause for the creation of West Chicago, a brief survey of the activities of those companies is in order. The G&CU (which eventually became the Chicago & North Western) was Chicago's first railroad. It began laying track west out of Chicago in 1848, with the intention of reaching first the Fox River, then Rockford, then Freeport, and finally Galena. The railroad arrived in what is now West Chicago in November of 1849 and reached Elgin in February, 1850. The decision to lay tracks directly northwest from the West Chicago area to Elgin upset residents of the Fox River Communities of Batavia, Geneva, and St. Charles. They realized that the new railroads were going to transform the area – for example, the 40 mile mail run by train in 1850 from Chicago to Elgin took three hours, while the 44 mile mail run by stage from Chicago to Aurora to Sugar Grove over mud roads took 16 hours. Any community without direct access to this new, speedy means of transportation would be at a serious disadvantage. Therefore, residents of St. Charles formed at St. Charles Branch Railroad in 1849. This line ran from St. Charles to a junction with the G&CU just north of present-day West Chicago. Another company built a 2 mile long track from St. Charles to Geneva, thus connecting Geneva, by way of the St. Charles Branch, with the G&CU at West Chicago. Batavia and Aurora residents were involved in the building of a different railroad, the Aurora Branch. This line (which eventually became the Burlington) laid tracks from the West Chicago area to Batavia and then Aurora in 1850. Thus, by late 1850, three railroads joined at what is now West Chicago. Because so many trains met at this junction point, water and fuel facilities for the locomotives were built here, as well as an eating house and hotel for travelers. Very quickly, a town formed, one that was known as Junction, Illinois. By 1853, for reasons too complex for this present publication, the G&CU halted the track-laying of its Chicago to Galena line at Freeport. The company decided instead to build a second mainline, running west from Junction to DeKalb and then Fulton, Illinois. Because its two mainlines met at Junction, the G&CU expanded its facilities here, building a 3-stall roundhouse and a mill for repairing rails. As a result, a number of new employees and their families located in the community. 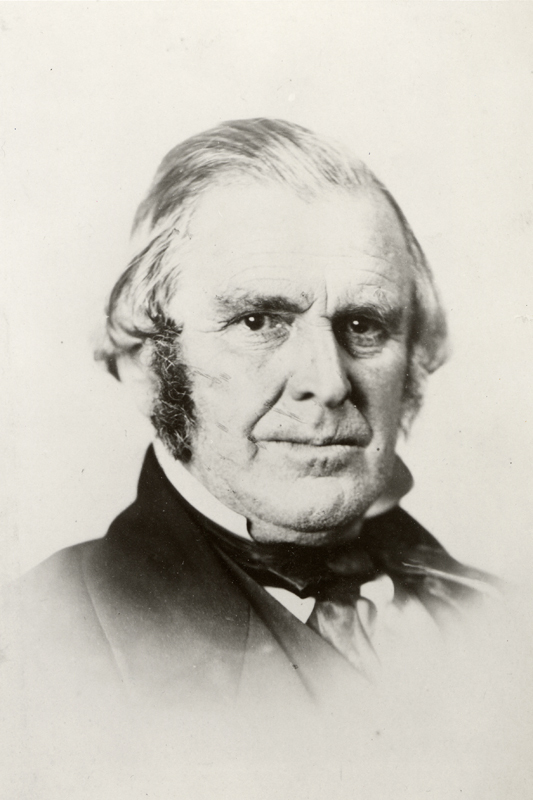 John B. Turner, president of the G&CU and a resident of Chicago, owned several acres of land in what is now the center of town. As more people settled in Junction, Turner recognized the chance to make a profit by platting his land and selling off lots. He therefore recorded the community's first plat in 1855 under the name of the Town of Junction. He also donated lots – one to the Congregational Church, another for an early school. Turner's plat is that section of town just south of Washington Street. 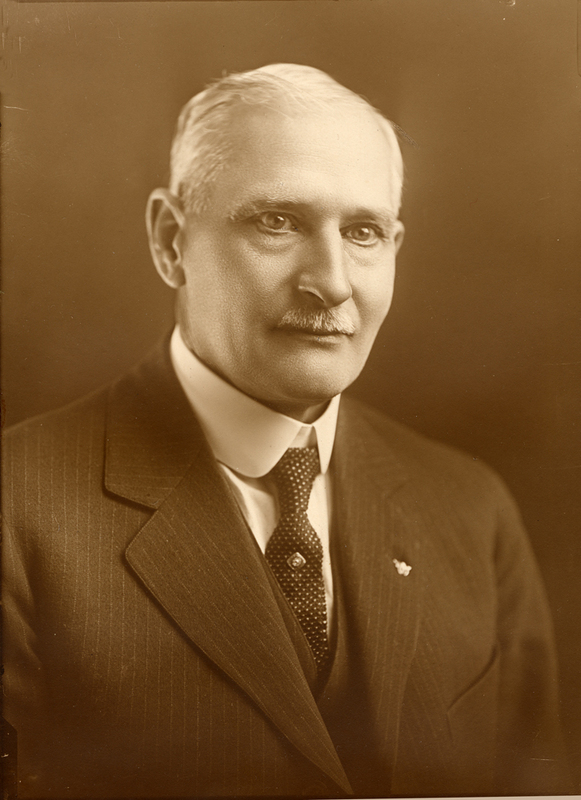 As a good railroad executive, he assigned railroad-related names to many of the first streets – Depot Street (now Main Street), as well as Chicago, Galena, and Fulton Streets, named after the three projected terminal cities of the G&CU. The community continued its growth, and in 1857 Dr. Joseph McConnell and his wife Mary platted a second portion of town, those lands lying just north of J.B. Turner's plat. The McConnells were early members of the Congregational Church and were deeply appreciative of Turner's donation of land to the congregation. Therefore, they chose to record their plat as the Town of Turner in honor of the railroad president. There now existed a platted Town of Turner and a platted Town of Junction, and as a result the community took on the name of Turner Junction. It was in the pleasant month of June, 1854, that I came to the small railroad town that is now known as Turner, Illinois, then only a Junction station of the Galena and Chicago Union Railroad, with its Dixon Air line and a road running south to Aurora and LaSalle. The principal buildings belonged to the railroad company. There was a two-story building 30 x 75 feet, used as an eating house. [There was also] the “Store” occupied by the McDonald Brothers and across the road was a small building used by W.I. Mowry as a post office and grocery. On one side of the highway [then North Street, now Washington Street] there was a brick blacksmith shop used for repairing T-rails. These were the principal buildings and not one of them is in existence at the present time, they having either been burned or torn down and removed. The railroad company owned twenty-two acres of land, lying northeast of the main track and south of the highway. This land was vacant at the time. On the north side of North Street were lands owned by Dr. Joseph McConnell, and southwest of the main track the lands were the property of the Winslow heirs. None of this land was platted, hence none had land to sell. Most of the residents, who were chiefly farmers or railroad employees, appear to have been of English or Irish stock. A sizable number came from New York state; tradition has it that they worked on the new railroads in New York in the 1840s and migrated west as Illinois' railroad boom began. 1860 and 1870 census information for Turner Junction is imprecise. The community did not draw clearly defined boundaries till it incorporated in 1873, and so census takers in 1860 and in 1870 counted everyone listed in the area of the Turner Post Office. The 1860 Figures show 722 residents, while in 1870 there were 1,086 residents. By the late 1860s, the Chicago & North Western (as the former G&CU was now known) built a substantial brick depot and a major roundhouse here. Several Church structures graced the community, including the First United Methodist Church, built 1855; and St. Mary's Catholic Church, built 1868. In 1870, St. Michael's Evangelical Church was added. The community had taken on a substantial and permanent character, and so the residents incorporated it in 1873 as the Village of Turner. 850 residents lived within the boundaries of the new village, with Lucius B. 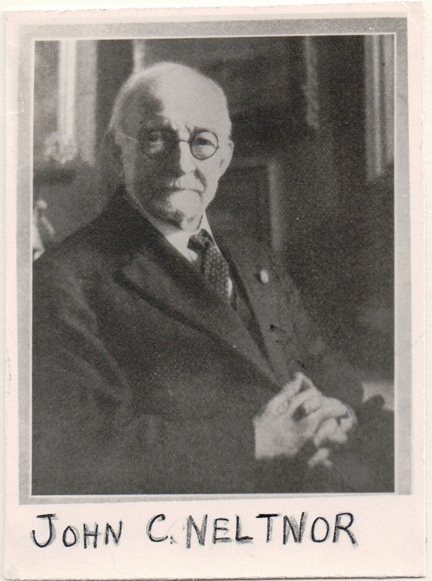 Church serving as the first village board president. Population continued to increase, growing to 1,001 in 1880 and shooting up to 1,506 in 1890. A sizable number of the new residents were German immigrants, with many of them apparently settling in the portion of town near St. Michael's church. This population growth demanded added services. 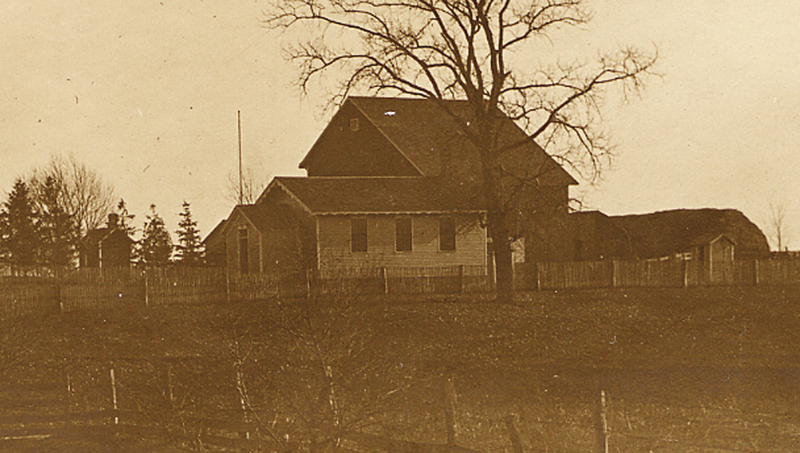 In 1873, the community built the substantial 3-story Turner Public School. In the face of the 50% population growth of the 1880s, the community added the Southside School in 1887 (renaming the 1873 building the Northside School.) And in 1884, the village board authorized the construction of the 3-story town hall, a multi-purpose building designed to house the volunteer fire department, a one man police department, and the village council chambers. During these early decades, Turner was chiefly a one-industry town. According to census data, nearly 40% of the men employed in non-agricultural occupation worked for the C&NW. This situation began changing in the late 1880s with the arrival of the new railroad, the Elgin, Joliet & Eastern or Outer Belt Line. This line is a feeder railroad rather than a cross-country one, transferring freight from one outlying Chicago community to another. 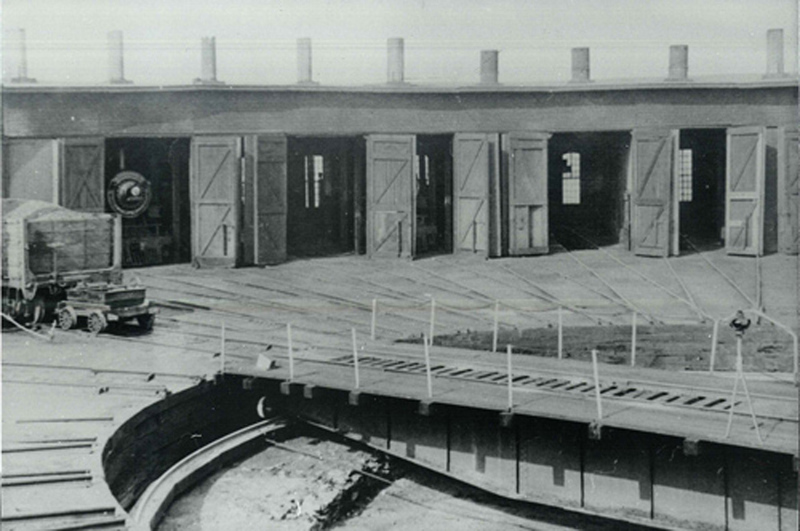 The success of the EJ&E is predicated on its having factories located all along its right-of-way as a means of generating freight traffic for the railroad. Turner offers opportunities to manufacturers, mechanics, homeseekers, and investors offered by no other point about Chicago at the present time. Turner has electric lights, asphalt sidewalks, two wide-awake newspapers, fine schools, prosperous churches, good society, and numerous flourishing factories that are bringing it to the front rank as a manufacturing point. [It is] located at the junction of the Chicago & North-Western Railway, the Chicago, Burlington & Quincy Railway, and the Outer Belt Line, giving it unequalled shipping facilities with Chicago freight rates. 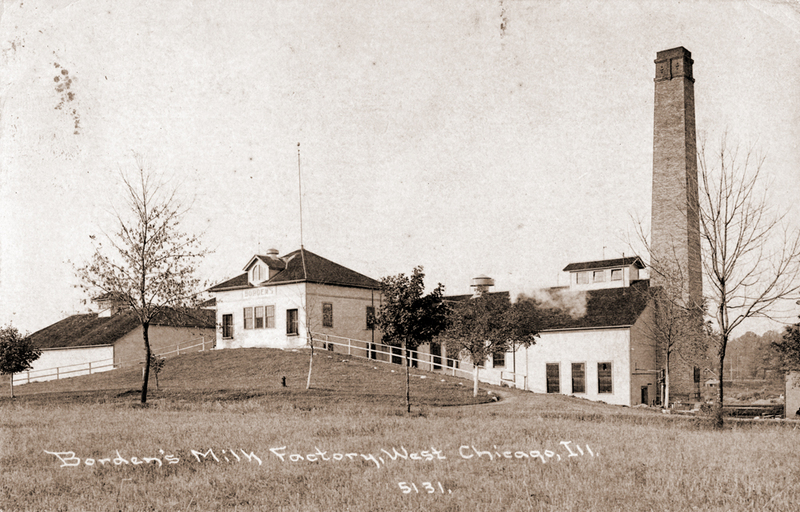 As part of this effort to attract industry, the community changed its name in 1896 to the Village of West Chicago. The reasoning apparently was that the name helped prospective industrialists visualize where in the state the town was located and that “West Chicago” sounded more industrial or metropolitan than did the “Village of Turner”. If we expect to induce manufacturers and others to locate in our midst we have got to stir ourselves on the subject of water works. Men cannot be expected to invest their money in a place where there is no fire protection. 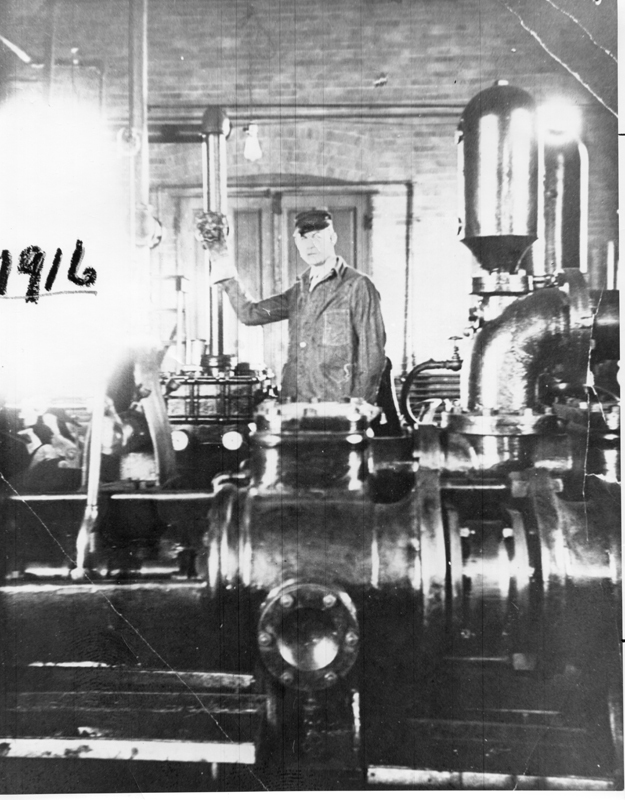 In October, 1896, a sharply divided community did vote for the water works, and the village board then authorized the creation of a pumping station, reservoir, & stand pipe. The village's effort to attract industry was hindered by a serious national depression in the 1890s. Nonetheless, several plants did open in West Chicago. 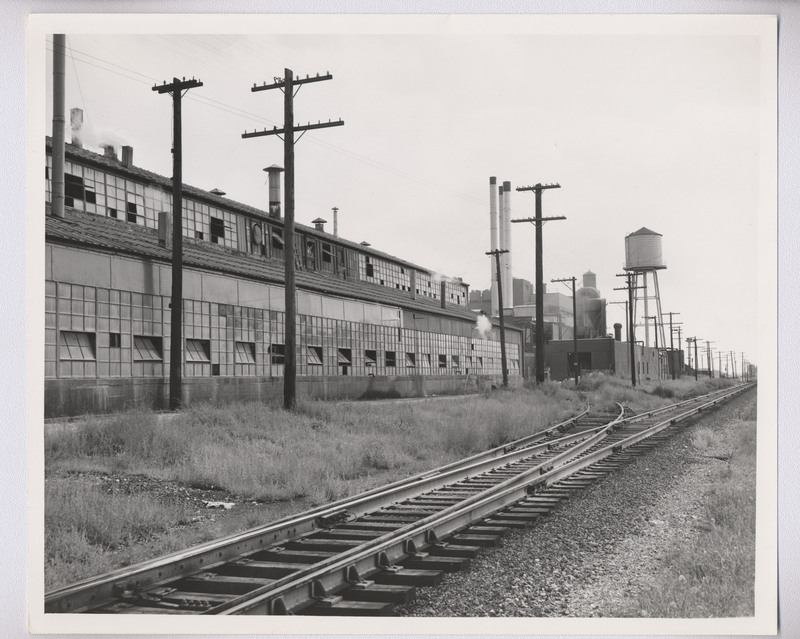 Some, such as the Stimmel & Hook Pump Works and Roach & Brandt Millwork (later West Chicago Sash & Door) built plants along the EJ&E, the railroad that initiated this industrial phase. 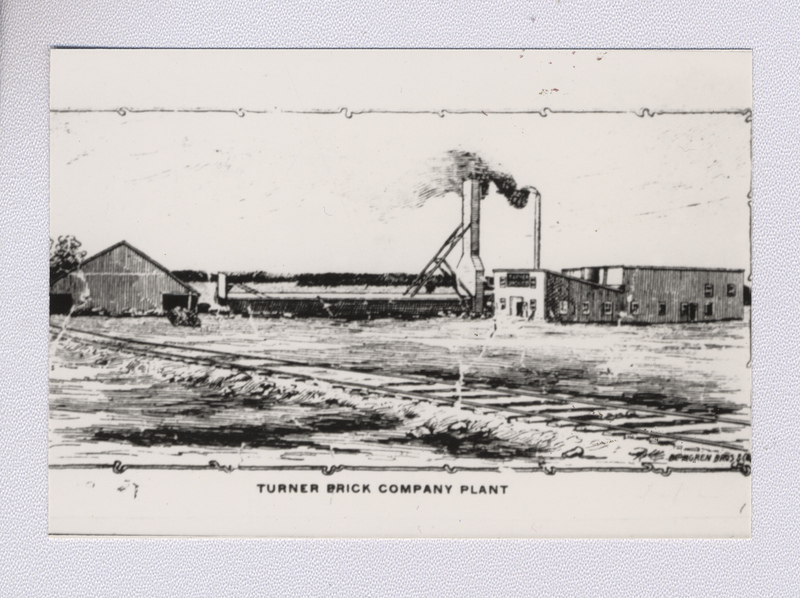 Other plants located along the C&NW tracks, including the Turner Brick Co. and the Turner Cabinet Co.
One of the largest enterprises was a Borden's milk condensing plant, built about 1906. Since the late 1880s, West Chicago was the site where one of the C&NW assembled a 15-car milk express destined for Chicago, drawing cars from three directions and from as far away as Williams Bay, Wisconsin. Because of the volume of milk passing through West Chicago and because of the dairy farms in the area, Borden's found this a logical spot for a milk plant. (The plant eventually became a Reid Murdock pickle plant and later Jel Sert.) As industry located in West Chicago and new jobs opened up, the population increased. By 1900 it reached 1,877, while in 1910 2,378 people resided in town. At the same time, new subdivisions were springing up in outlying areas. One of the moving forces behind these ex-urban subdivisions was the new electric interurban, the Aurora, Elgin & Chicago (later to be reorganized as the Chicago, Aurora & Elgin.) This line began service from Chicago to Wheaton to Elgin in the fall of 1902. In 1909, it added a line from Wheaton through High Lake subdivision to West Chicago and on Geneva. Just as the EJ&E earlier tried to attract industry to its right of way, the AE&C promoted residences along its tracks, hoping to generate passenger traffic for itself. High Lake, with its communally owned lake and lodge, was one such street car suburb promoted by the interurban – even to the point of the railroad commissioning the foxtrot “Come Where the Birds Sing” to promote High Lake. The increased population brought added demands on the community. In 1904, High School District 94 was formed, and in 1908 a new and larger school building replaced the old Northside School. 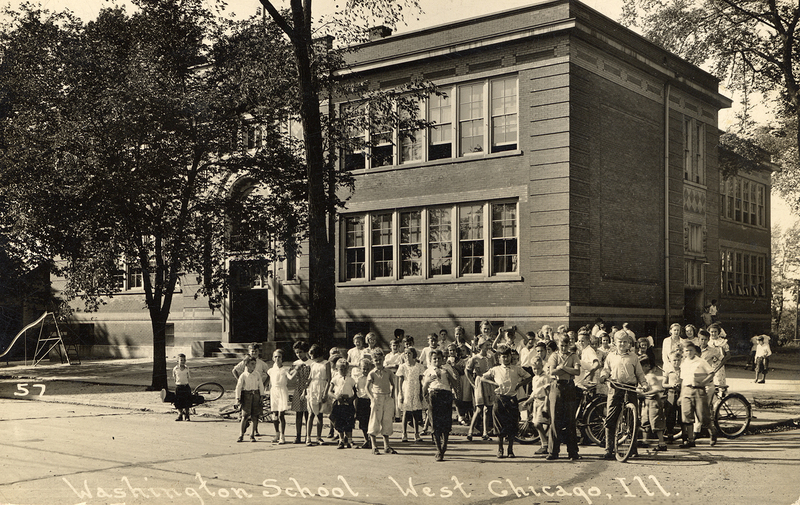 This new building, eventually known as Washington School, housed half of the 1st through 8th grade classes as well as all of the high school classes. 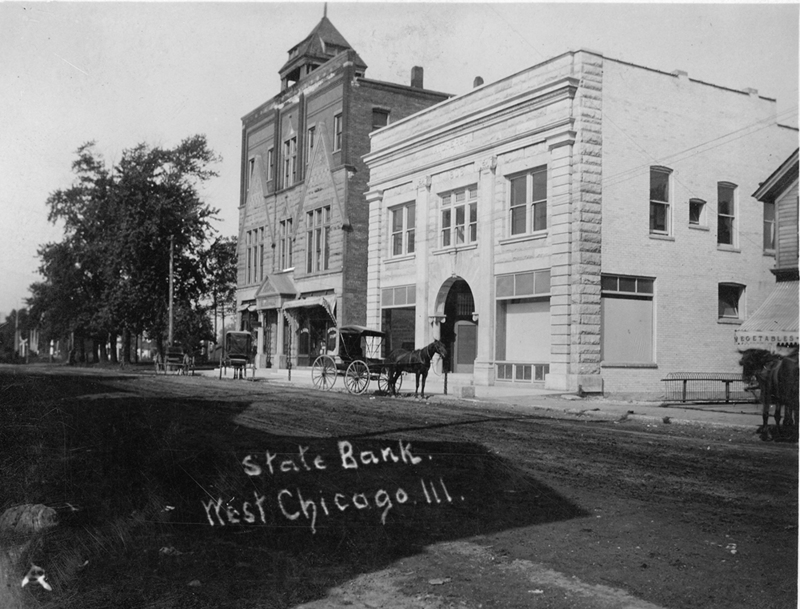 And in August, 1906, the village reincorporated itself as the City of West Chicago, with banker Grant A. Dayton serving as first mayor. The city's population grew by only 9% during the 1910s, reaching 2,594 in 1920, but then grew a dramatic 30% to 3,477 by 1930. 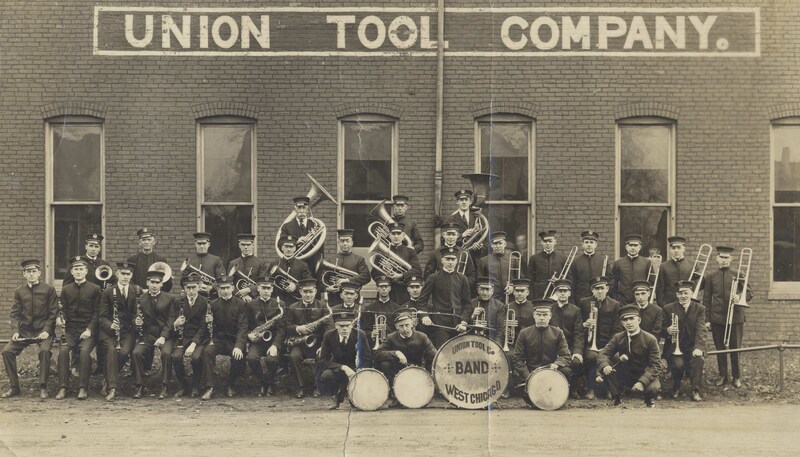 Industry continued to expand, although a major foundry, Union Tool Co., relocated to Ohio. Several changes occurred during these decades. In 1912 the C&NW built a new passenger depot (now the Wayne and Helen Fox Community Center) and an underpass, as well as the Wilson Street Bridge over its mainline as a means of reaching its roundhouse area. At the same time, the railroad moved its 1869 depot to the north side of what is now Washington Street, converting it into a freight depot. This new location for the old depot was adjacent to the coach yards, where the suburban commuter coaches were stored overnight and where as many as four coal-burning steam engines fired up at a time each morning. Two important changes relating to schools also took place. 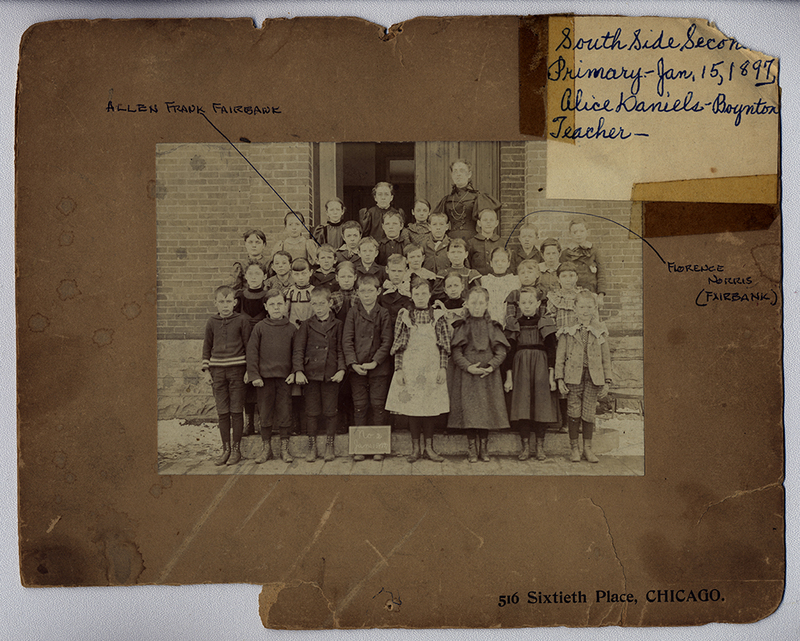 After the Southside School was destroyed by fire in 1919, Lincoln School was built in 1921. And by the mid-1920s, the Northside School had become so over crowded that two rooms for high school classes were rented in the back of the nearby Buick salesroom. 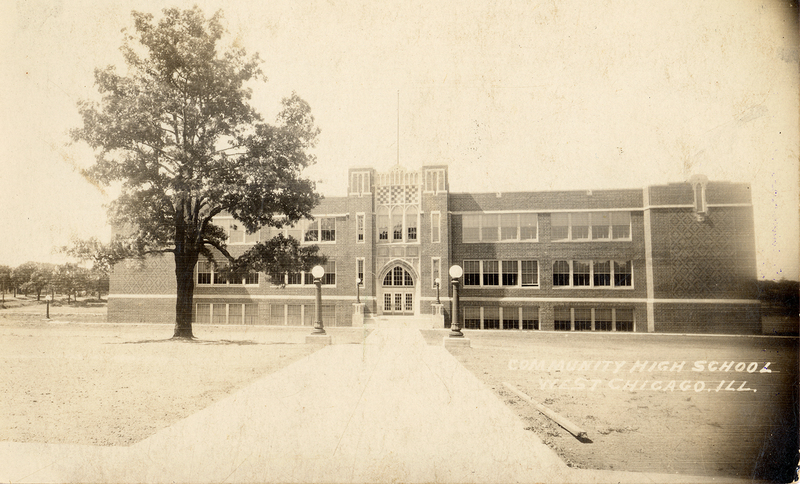 Therefore, in 1926 the new high school was built on Joliet Street. 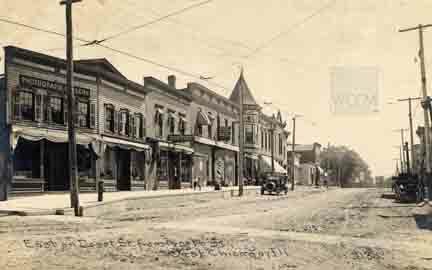 At the same time, in 1923-25, the city government under Mayor Edward J. McCabe embarked on a major street improvement program, building 9 miles of concrete streets and installing an ornamental street lighting system. And starting in 1930, the city renamed several streets and instituted a new numbering system for building addresses. 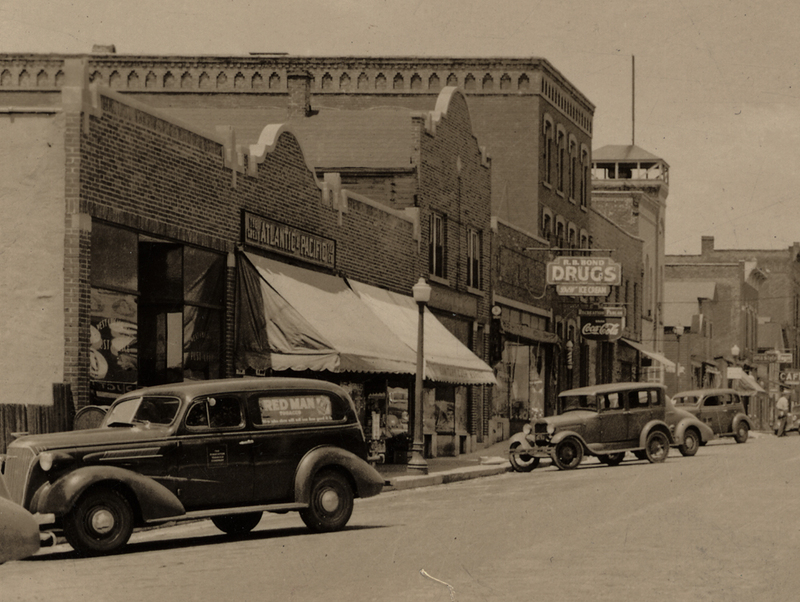 The decade of the 1930s saw the town's development slow dramatically. The population actually decreased by 122 residents to a total of 3,355 in 1940. The CA&E interurban abandoned its West Chicago branch in 1937, and the city government opened the City Hall at night as a sleeping place for homeless. World War II brought new economic vitality, which was dramatically increased in the post-war years of suburban growth. The population grew 17% during the 1940s to a 1950 total of 3,973; a whopping 72% during the 1950s to a 1960 figure of 6,839; and another 47% during the 1960s to 10,100 in 1970. Part of this growth reflected annexation of existing developments, but much of it resulted from new building, including the construction of a number of apartment complexes. By 1980 the population reached 12,500. 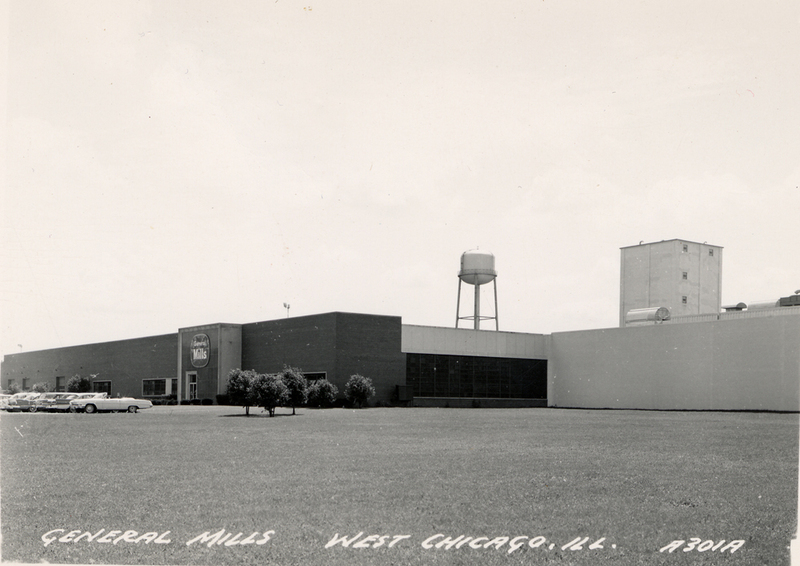 Significant changes in the face and structure of West Chicago occurred throughout the post-war period. 1972, however, seems to have been a watershed year. Before that, many community projects – some successful, some not so successful – were attempted by civic groups. 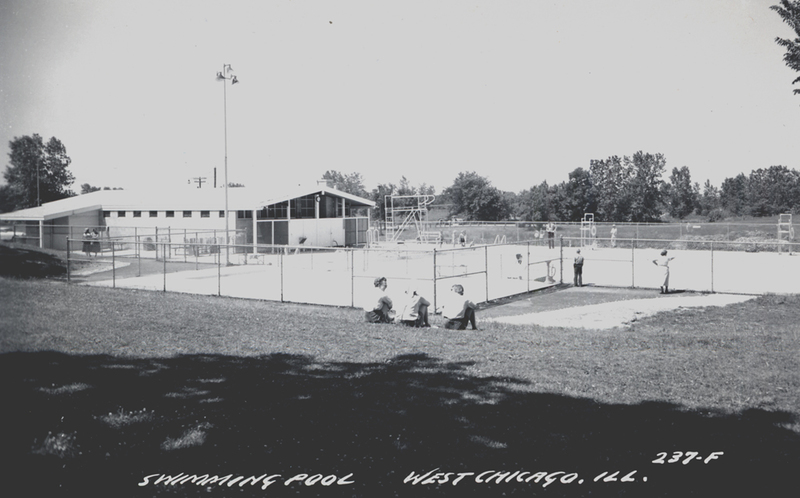 The newly formed Rotary Club of West Chicago created the Swimming Pool Association in 1954-5, which in turn sold $100,000 in bonds and built an outdoor pool in the city-owned Reed-Keppler Park. Through local volunteer effort a scout cabin was also built in that park. 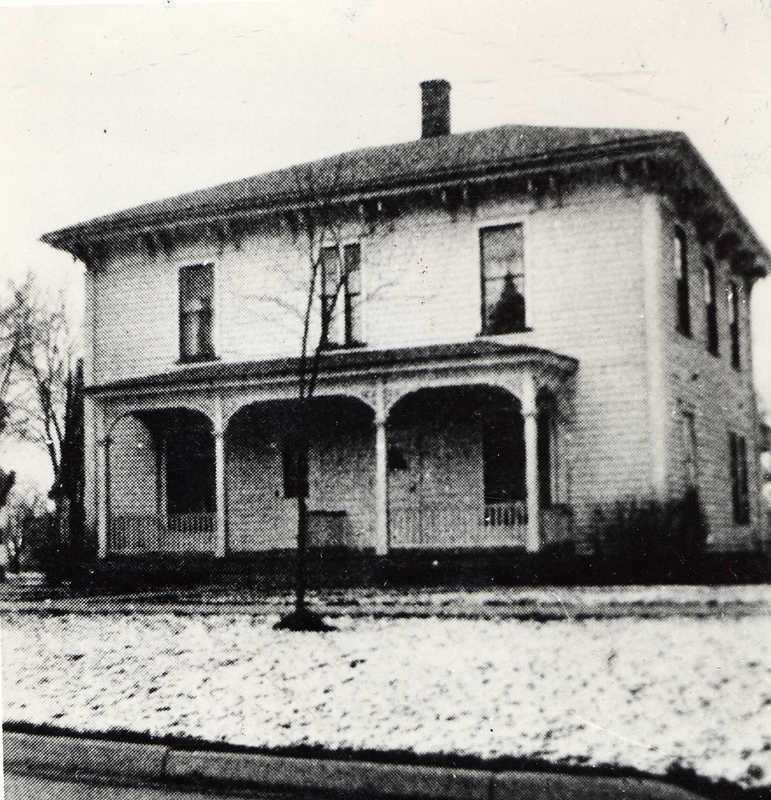 The West Chicago Railroad and Historical Society was formed in the 1960s and attempted to save one of the town's most famous houses, the Neltnor or Anthony Home, as a museum. This effort failed and the building eventually was destroyed by fire, although the Society remained in existence till it was absorbed in 1975 by the new West Chicago Historical Society. There were, of course, several notable exceptions to the general pattern of civic groups, rather than governmental agencies, trying to carry out community projects. 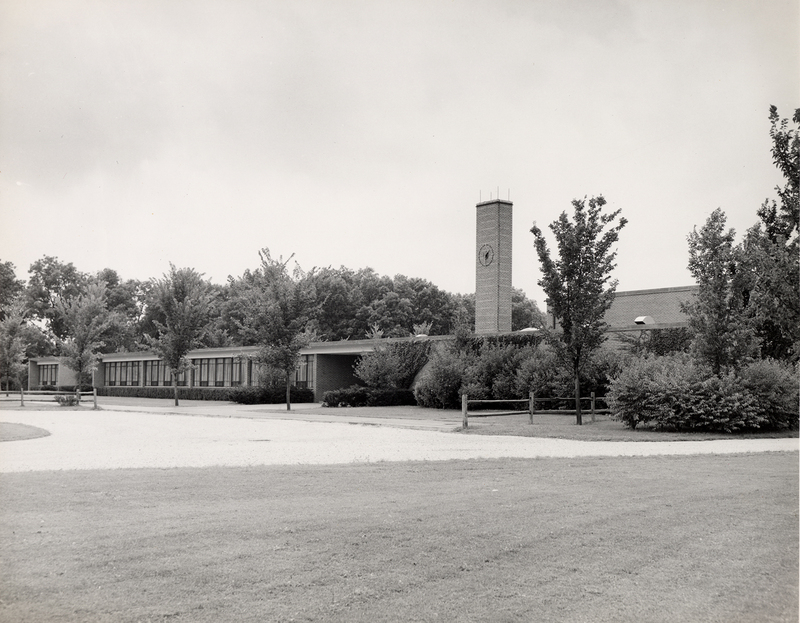 In 1954 the handsome new Public Library building was built with tax monies, and in 1964 the city government assumed the operation of Oakwood Cemetery, established in 1858 by the McConnells, in face of the dissolution of the Oakwood Cemetery Association. While civic groups remained active in community efforts during the 1970s and 80s, governmental bodies assumed more of a leadership role. In 1972 the Park District was formed. It signed a long-term lease with the City to assume operation of Reed-Keppler Park; for several years operated the outdoor swimming pool for the Swimming Pool Association, until the City began operating it in 1981; and acquired Easton Park, Pioneer Park, and Manville-Oaks Park. The city government, in the meantime, found it had outgrown the 1884 Town Hall building. Fire Fighting equipment had already been moved out when the separate Fire District was formed, replacing the volunteer company, and built its fire station in 1969 on the former site of Washington School, while the City's Police Department had relocated to McConnell Street. 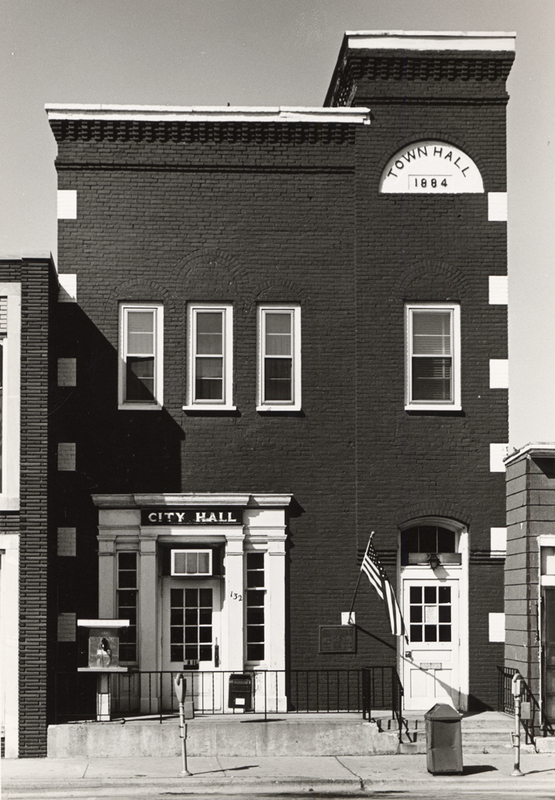 In 1975, under Mayor Richard Truitt, the City bought and renovated a former Jewel Food Store and moved its offices and council chambers there. Under the leadership of Mayor A. Eugene Rennels, the City worked with Nature Conservancy to purchase a 150 acre tract of virgin prairie on the western edge of town. 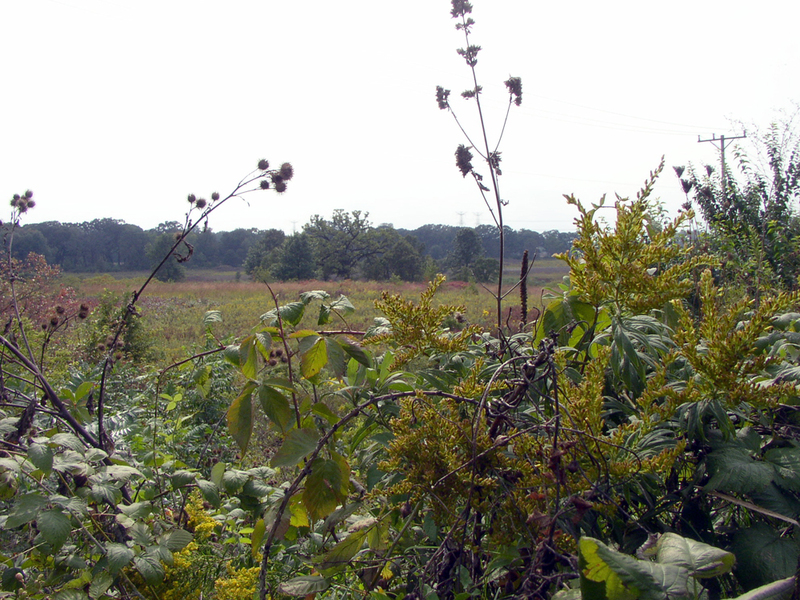 The operation of this land, possibly the largest remaining tract of virgin prairie in Illinois, has been turned over to the Forest Preserve. And in 1981 the new West Chicago Community Center, Inc., a not-for-profit group that had its genesis in the West Chicago Coordinating Council of the late 1970s, acquired the 1912 C&NW depot for use as a community center. Raising tens of thousands of dollars and receiving much volunteer labor, the Community Center renovated the old depot dedicating it in July, 1983. The Chamber of Commerce, another active organization of the time, moved its offices to the depot that summer. In one small sense, West Chicago's history was brought full circle in 1981 when the C&NW located its Illinois division headquarters in West Chicago, on the former site of the old roundhouse. This move by the C&NW appears to guarantee that West Chicago, the coming of the railroads, will remain a significant railroad town for the foreseeable future. John Bice Turner, who is identified with the founding of this community, was born in 1799 in Colchester, New York, and died in Chicago in 1871. During his youth, Turner lived on a farm, but in 1835 he became engaged in railroad and canal constructing business in New York State until 1843, when he came to Chicago. 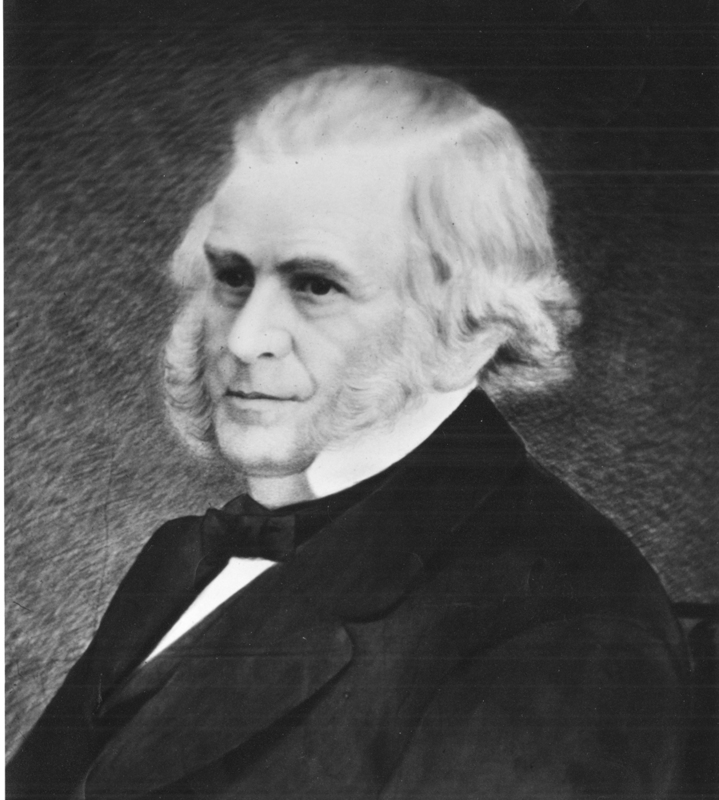 In 1847 Turner became acting director of the Galena and Chicago Union Railroad. A year later he bought a large tract of land here and thus predicated the future site of West Chicago, and in 1855 platted the Town of Junction, as this community was first called. He served two terms as president of the Galena Road and was its last president when the consolidation with the Chicago & North Western Railway took effect in 1864. This map shows the original Town of Junction as platted by John B. Turner in 1855. The land to the north, owned by Dr. Joseph McConnell, was platted in 1857 by McConnell as the Town of Turner. The lots containing the old Congregational church and school house [as shown] were donated by Turner. The church structure, however, was not erected until 1868. 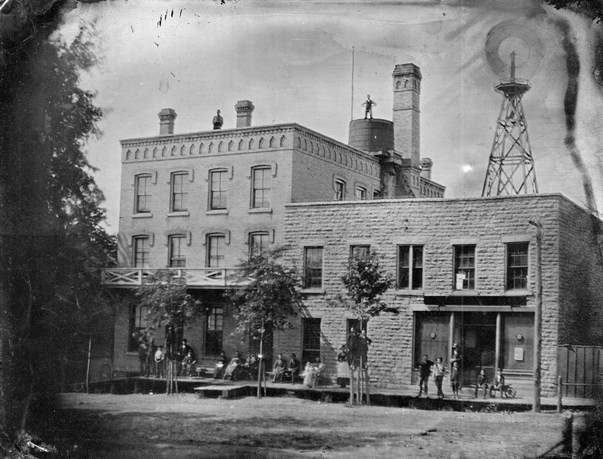 To the north of today's West Washington Street is the first location of the Galena and Chicago Union Railroad's engine house and turn table, and its machine shop. The wood-burning locomotives of that era account for Galena Road's three wood sheds and three water wells or tanks. Before Junction was platted, Turner in 1851 permitted the erection of a small school house near the southwest corner of High and Washington Streets. Later the land was deeded to the Congregationalists. In June 1857, Turner donated lots 1 and 2 in Block 5 as a new school site, with a building being erected that year. In 1873 it gave way to the now vanished North Side School, but the old building on Fulton Street survives to this day as private dwelling. Turner's true character, kindness and compassion are manifested in an 1858 deed on the sale of a lot on Main Street for one cent to the widow of Andrew Wheeler, the mother of eight youngsters. Because of Turner's generosity to the new community, Dr. Joseph McConnell named his plat, north of Washington Street, the Town of Turner. Two streets and an elementary school still bear Turner's name. 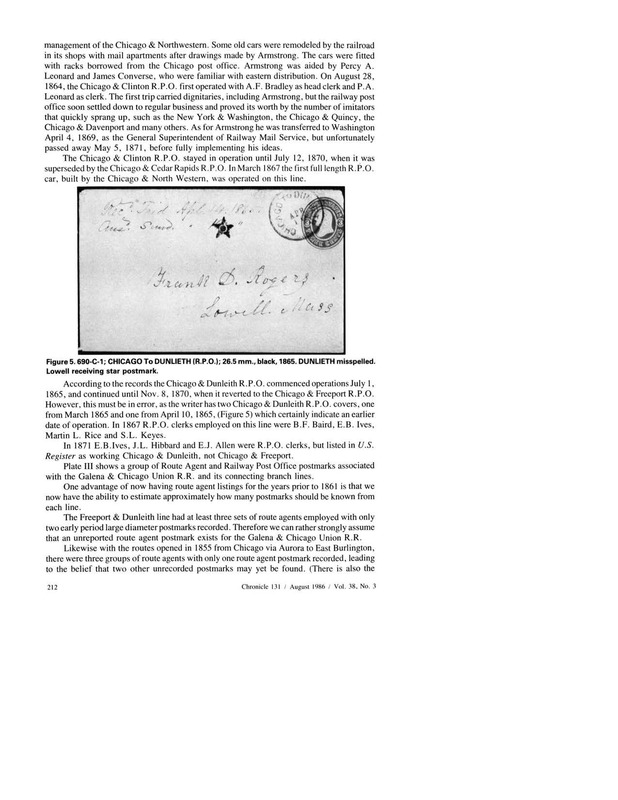 The early settlers who came to DuPage County were not isolated entirely from their former home ties in the East and other states as mail communications soon followed their new settlement. 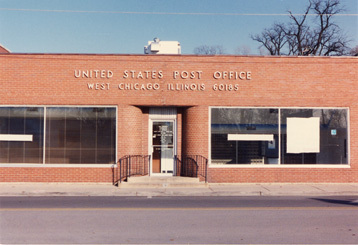 According to postal records, the West Chicago post office descends from the West DuPage office, in Wayne Township, on the route of the Frink and Walker stage lines carrying U.S. Mail from Chicago to other stations in this section of Illinois. This office was established on December 9, 1845 with Robert Y. Benjamin as postmaster. It was located in the pioneer settler's home. 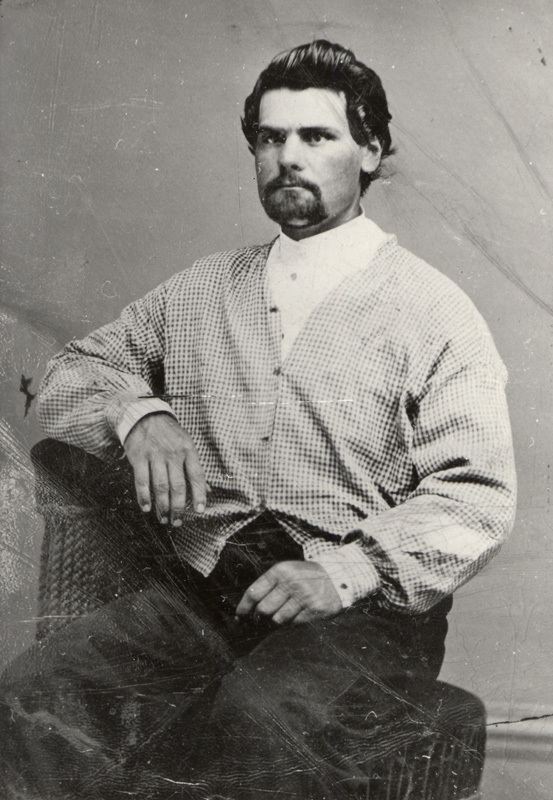 Giles Billings, Benjamin's brother-in-law, replaced him as postmaster on January 5, 1850. The office was located in the country tavern conducted by Billings on the old St. Charles Road and the present Route 59. 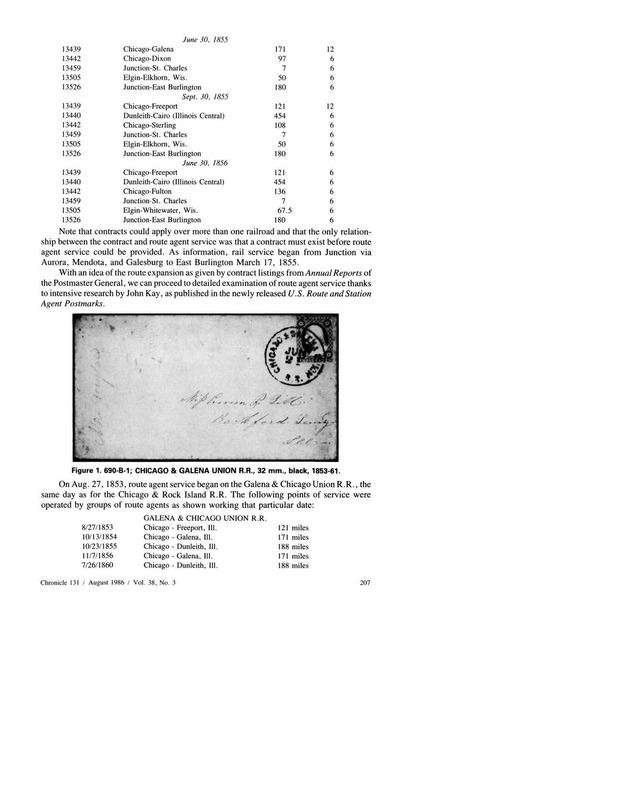 With the inauguration of daily rail service to Junction (West Chicago) and the awarding of a mail-carrying contract* to the Galena and Chicago Union Railroad, the West DuPage office was discontinued in 1850 and transferred to Junction. The station name of Junction was maintained by the railroad company for many years, but a petition by some residents about 1856 brought a name change for the post office and caused considerable confusion. However, it was beneficial to Dr. Joseph McConnell who platted a large tract of his land holdings as the Town of Turner, and the new post office name further enhanced the promotion and sale of lots in his subdivision. The location of the offices here in the early years depended on the postmaster's occupation and business preference. Quarters in Charles Clark's lumber office were rented for many years, where, a newspaper reported, girls were employed in the postal department. While postmaster in one term, John C. Neltnor and his three older sons constituted the post office department here. In the closing years of the Civil War, the officials of Winfield Township held meetings in the local post office, and in later years the Turner board of trustees also held a number of meetings in the building which served as a post office. 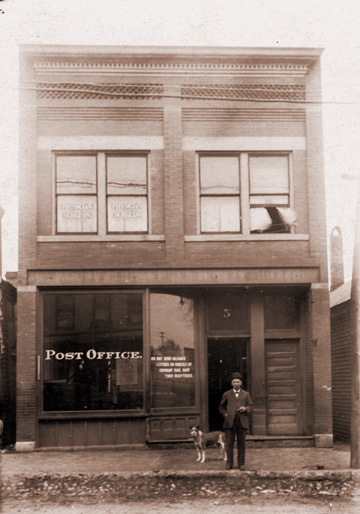 According to a local newspaper item, the post office moved on July 31, 1898 to the newly-completed Spielman building, located on the east side of Main Street, where Postmaster John Creager had his quarters. 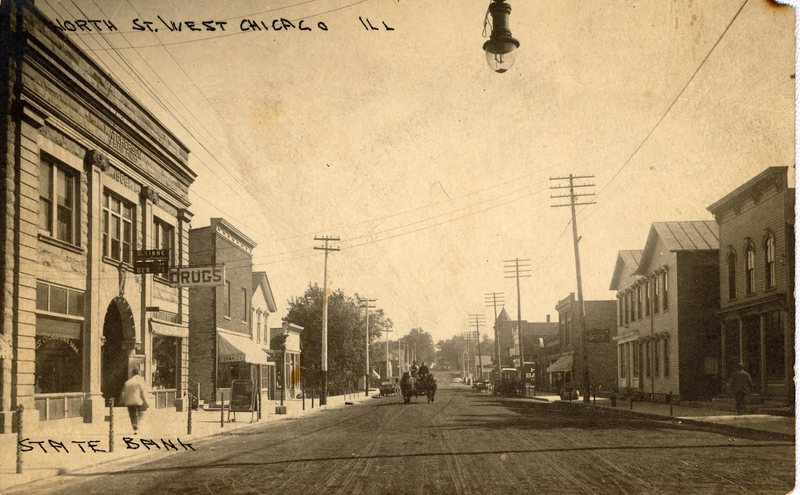 On January 2, 1905, four rural routes were established from West Chicago. 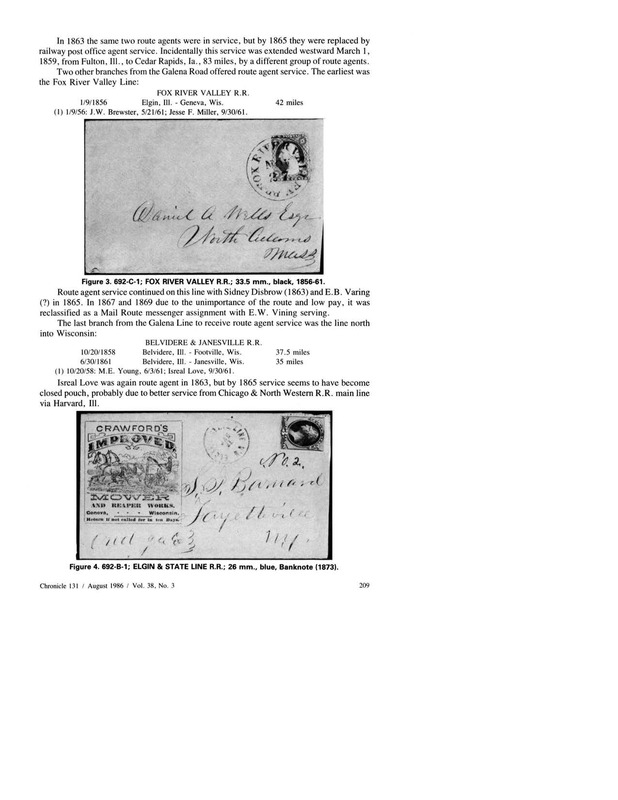 The annual salary of the local postmaster in 1914 was $1,900. Local delivery was inaugurated in 1917 with two main carriers, and in 1927 West Chicago became a second-class post office with one additional carrier, and parcel post was included. McDonough's DuPage County Directory for 1924-25, using the old house numbering and street name, locates the post office here at 32 Depot – just south of today's historical museum on Main Street. The department consisted of Postmaster Louis J. Neltnor, two office clears, two city carriers, three rural carriers, and one substitute carrier. A West Chicago City Directory, published in 1940, gave 212 Main Street as the post office address; it was the final Main Street location. After a long stay on Main Street the post office site was moved to a newly-built and leased building at 111 Fremont Street, and from here moved to its location in the remodeled Krumpholz building, 131 Fremont. As you read this chapter, keep in mind that it was written in 1984. Therefore, information presented as "current" would have been current - in the year 1984. 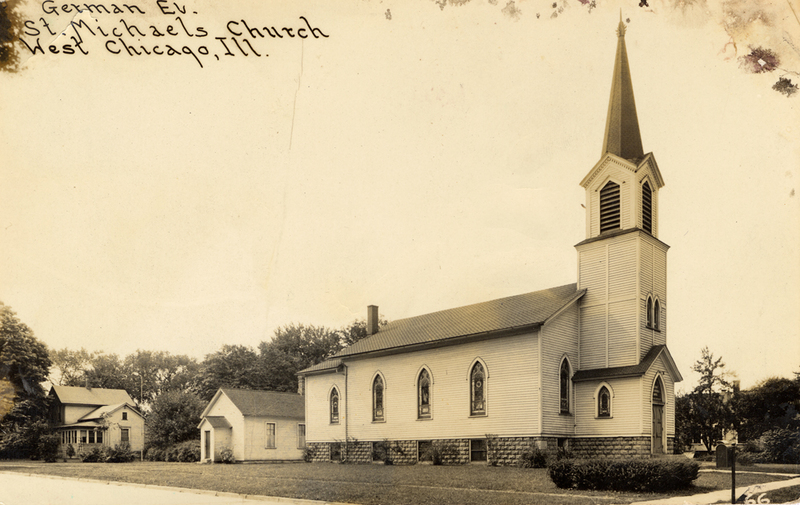 A century ago [from time of publication in 1984] only four church structures graced West Chicago's landscape, and most of these religious groups had their organizational beginnings in the homes of the early settlers or in early-year schools. Today, only St. Michael's with its picturesque spire, added in 1890, remains almost the same as when built in 1870. The Methodist Society was first organized in the Gary's Mill settlement when Charles Gary's home was used as a regular preaching place. Some time after the arrival of the railroad the congregation met in member' homes or in the school house here. The first edifice of the First United Methodist Church in Turner was built in 1858 at a cost of $1350. The contractor was George Videtto. (As an historical footnote, his wife was the first to be interred in Oakwood Cemetery.) In 1869 the church building was remodeled, and in 1886, more extensive alterations were made. 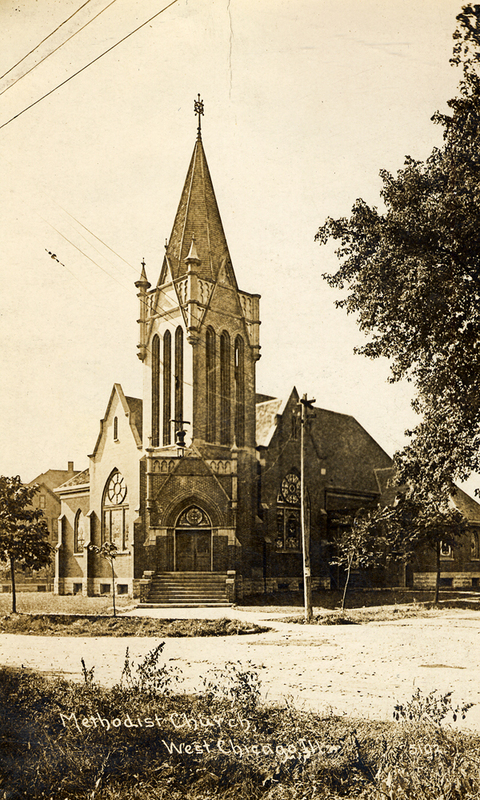 The present church edifice, costing $15,500, was dedicated in February, 1903. In 1918 a full basement was dug under the entire church and other improvements made. The church spire was removed from the structure, and the imposing tower and bell chimes are its distinguishing features. In 1958, a new Church School annex was built. Recently, the church building was completely renovated on the outside – the brick sandblasted, with repairs to the roof and the bell tower. 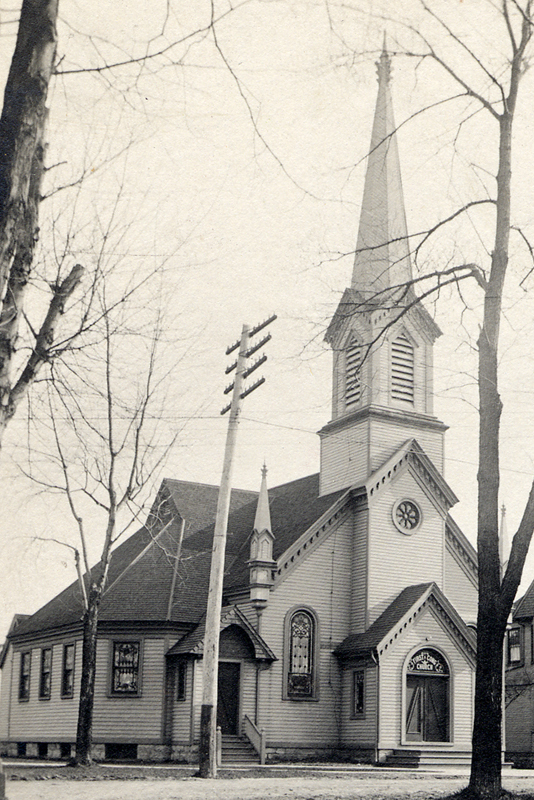 The congregation, in 1985, will celebrate its 150th anniversary. The pastor in 1973 was Rev. Charles Person, and Rev. Kathleen Hendricks is the current pastor. 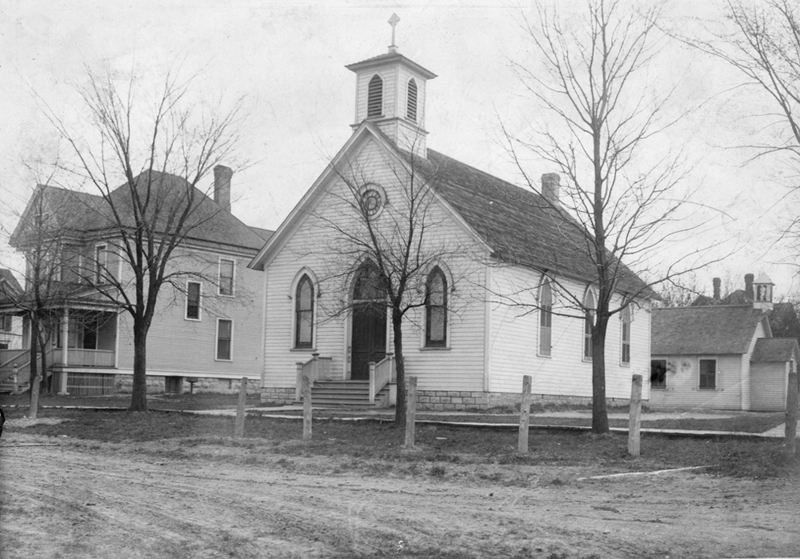 Although “the Congregational Church and Society of Turner, Illinois” was organized in 1856, it was not until 1867 that plans were made to build a church, which was completed the following year. John B. Turner, owner of the Junction townsite, donated a splendid lot for church purposes. Prior to the completion of the church building, the congregation met in the school house of in the homes of members. The church structure, with a towering spire, underwent major remodeling in 1954, but about the same time, plans were being formulated for a new building on a site that would allow for expansion and off-street parking. In September 1960, ground was broken for a new church structure at 525 North Neltnor Blvd. (Rte. 59), north of Elmwood, and it was dedicated in April, 1962. The present minister is Rev. Welton Warkentin, and the Rev. Jacob M. Warkentin is pastor emeritus. 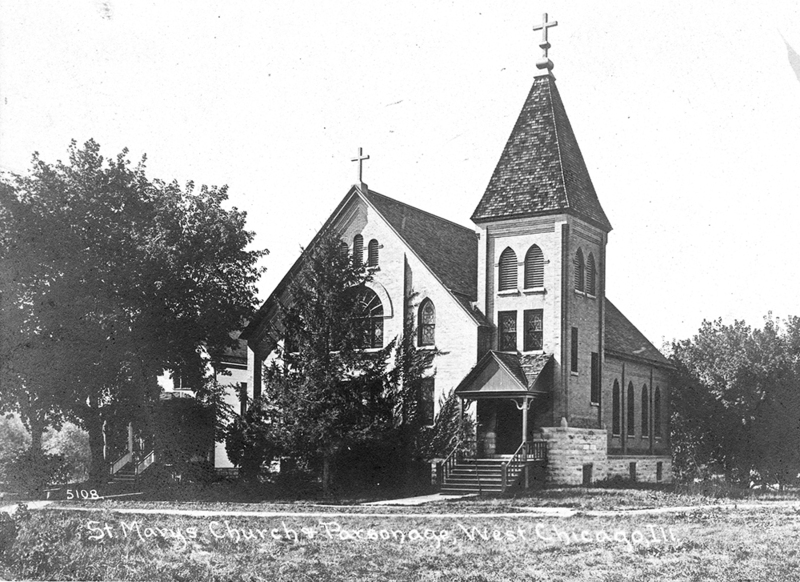 Today's St. Mary's Catholic Parish began as a part of St. Patrick's Parish of St. Charles as early as 1853, and in 1865 was established as an out-mission of the Batavia parish. Two tracts of land were donated by Dr. and Mrs. Joseph McConnell, non-Catholics. The first grant, a lot eight by six rods, was made in 1868 and upon which a Gothic structure, 32 by 50 feet in size, was built that year. The following year and additional 24 square rods of land were deeded to the Catholic Bishop of Chicago for the use of church purposes only. In November, 1893, Rev. Ambrose Goulet became St. Mary's parish first resident pastor and remained in charge until September, 1898 when he retired. Fr. Goulet built the present brick church in 1894 and a few years later the rectory. Both structures have been remodeled through the years. 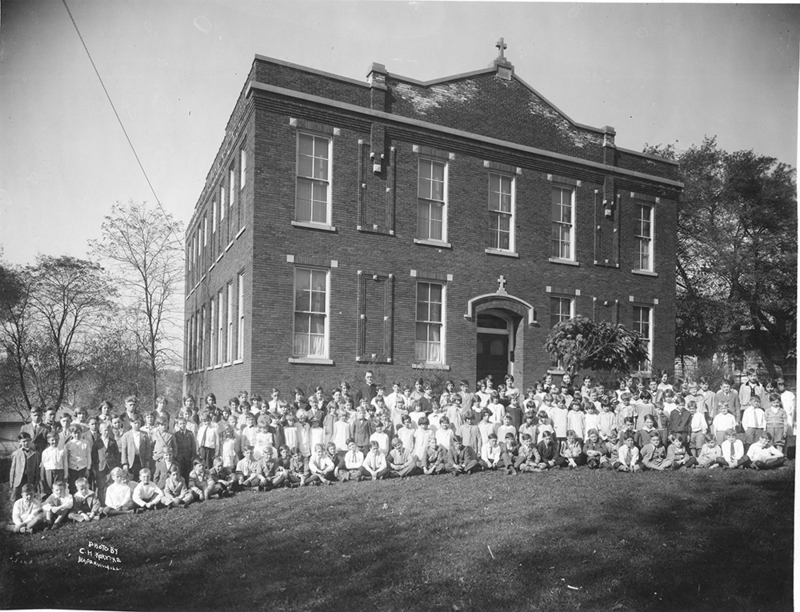 The first parochial school was built in 1922 and a new school building constructed in 1955. The convent was erected in 1960. The 1973 pastor was Rev. 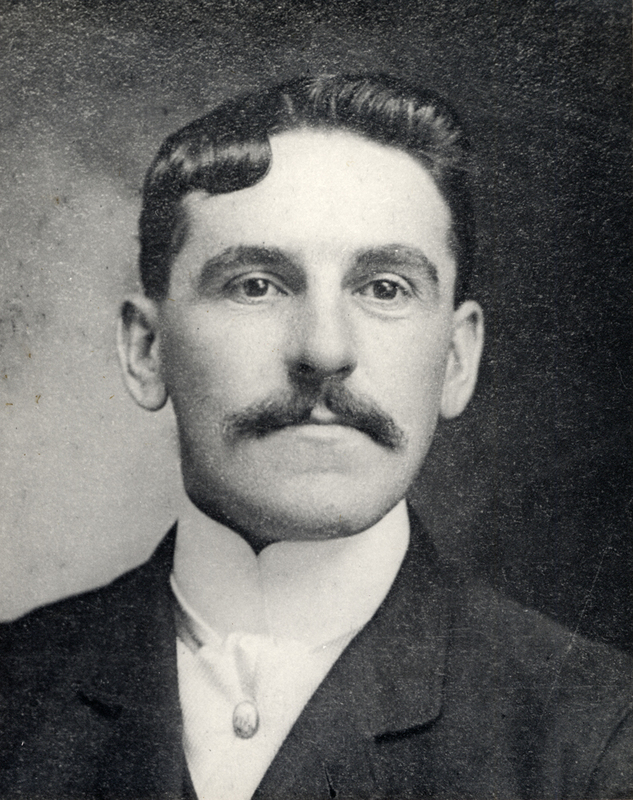 Henry L. Wilkening. The present pastor is Rev. James Ratigan, with Rev. William Conway as assistant pastor. 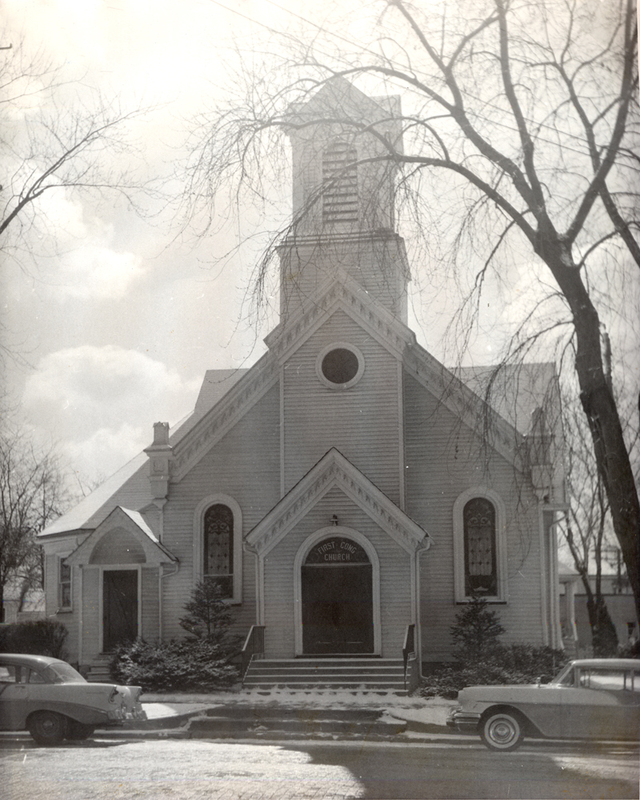 St. Michael's United Church of Christ traces its beginnings to 1867 when a number of German families were organized as the Evangelical Lutheran Congregation and held services in the local Methodist church for two years. Then in October, 1869, the group was reorganized as the German United Evangelical St. Michael's Congregation of Turner Junction. 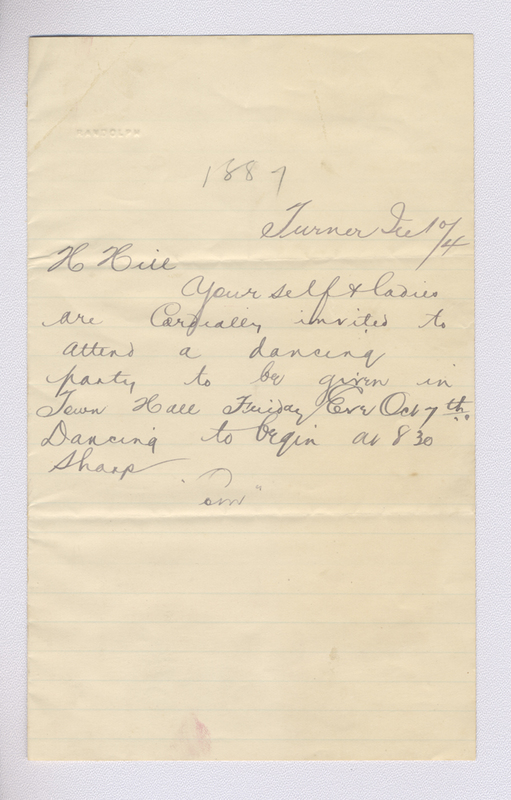 In February, 1870 a contract was let for the construction of a frame church structure at a cost of $2325. One lot was purchased from Capt. Lucius B. Church, the subdivision owner, who donated money and another lot to the congregation. The lofty spire was added in 1890. In the years that followed extensive remodeling and improvements to the original structure were made. The new educational building was erected about 1963. The Sunday School and The Gingerbread House day care center are located in the educational building. With the merger of Congregational Christian and Evangelical and Reformed Churches in 1961, the present church title was adopted. Rev. Eugene Birmingham is the current pastor. The first structure of Trinity Evangelical Lutheran Church was a frame one built in 1889. 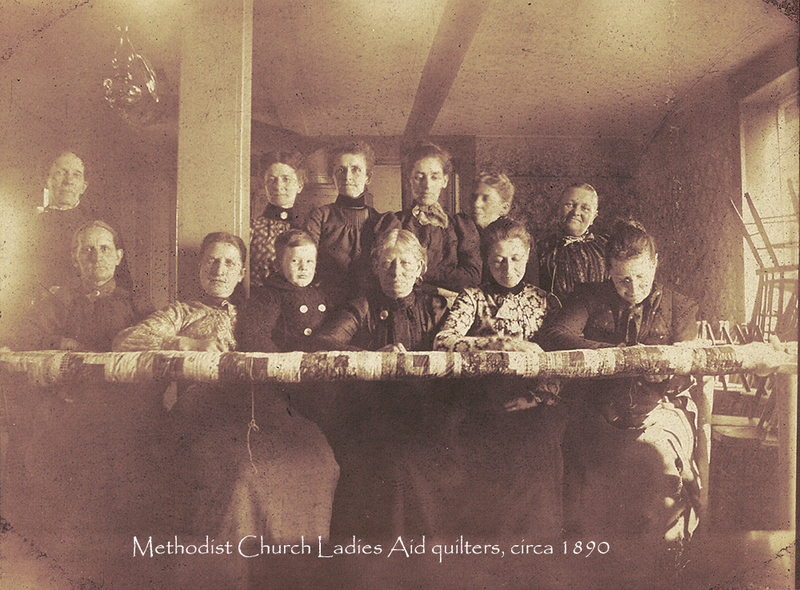 Prior to that, local and nearby Lutheran members worshiped in private homes or in the Methodist church building, and were formally organized in 1884. The present brick structure was built in 1923-24 and dedicated in March, 1924. It has a Christian Day School across the street from the church. Rev. D. G. Dannenberg was the pastor in 1973, while Rev. Edwin Lazarz, who succeeded him, died in 1981, and was followed by Rev. Leon Ernie Savage, the current pastor. 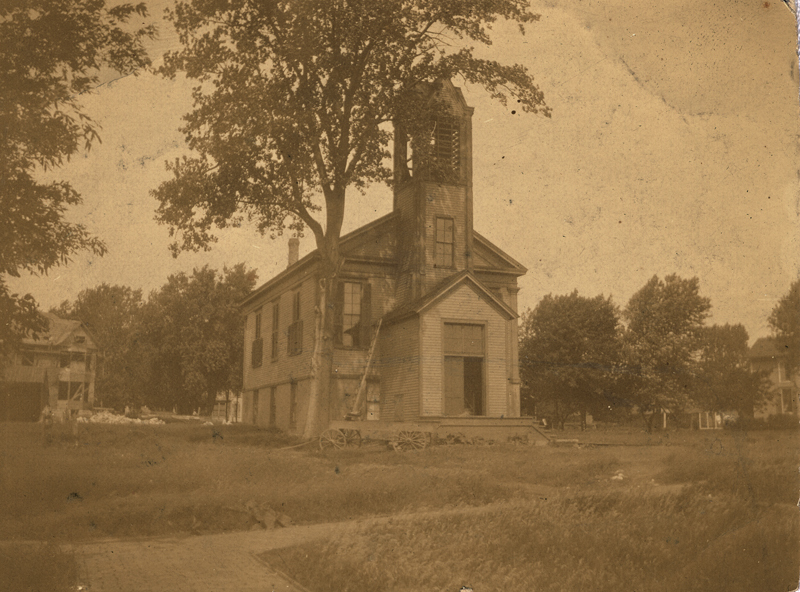 The West Chicago Bible Church had its beginnings as a Sunday School back in 1933. First meetings were held at a York Street home. 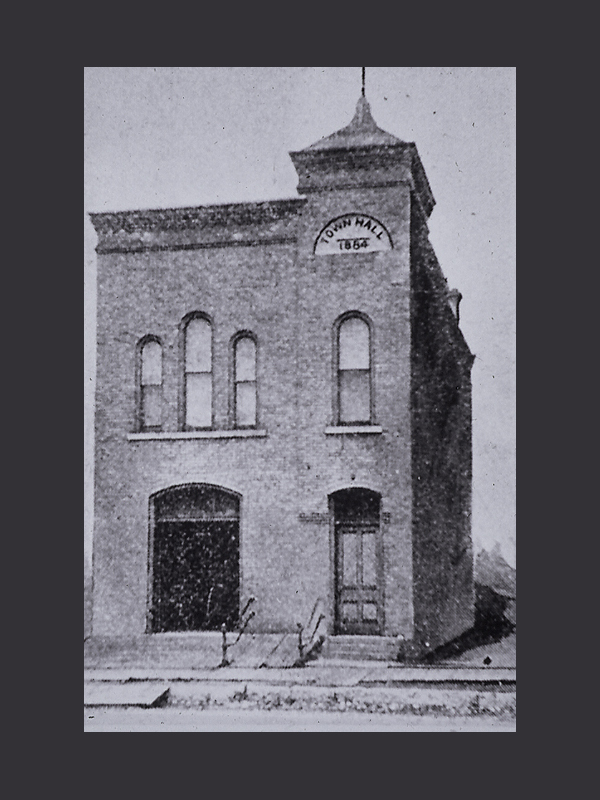 New larger quarters were needed for the growing membership and the congregation rented the odd Fellows Hall, 117 Main, as their meeting place until 1942, when they moved to a building on Main and Center Streets, now the site of the Illinois Bell Telephone Building. Now located on the corner of Oakwood and Summit, the church structure had three phases of construction between 1951 and 1959 before being completed. The present pastor is Rev. Howard Westlund, who is assisted by Pastors Gordon Evans, Rich Tuttle, and Roberto Vergara. The West Chicago Church of Christ was formed 30 years ago when a group of families attended worship services in the Masonic Hall on West Washington Street. In 1956 the congregation purchased two lots on the corner of Ingalton and James Avenue where a church structure was erected. The same year Oliver Rogers became minister, and the first services there were held in 1957. The building was extended in 1962. In 1973 the minister was Larry Owen. Sherril Cox, the present minister, followed Ralph Burris, who served four years before being called to ministry in Indiana. The First Baptist Church, located at 464 Ann Street, was organized in 1962 and a building erected in 1963. The present church was built in 1966, and a third building was added in 1980. Rev. Bob Wagner, the former pastor who now has a pastorate in Marion, Ill., was followed by Rev. Paul mount, the present pastor. The unique edifice of the Church of the Resurrection, Episcopal, was dedicated in September, 1964. The Building seats 200 and is planned for future additions, and is located on Route 59 off Gary's Mill Road. The congregation formerly held services on Main Street and at Gary's Mill School. Rev. Monte J. Tiller, the present vicar since August 1982, succeeded Rev. Arthur W. Benolken, the vicar who died December 1981. 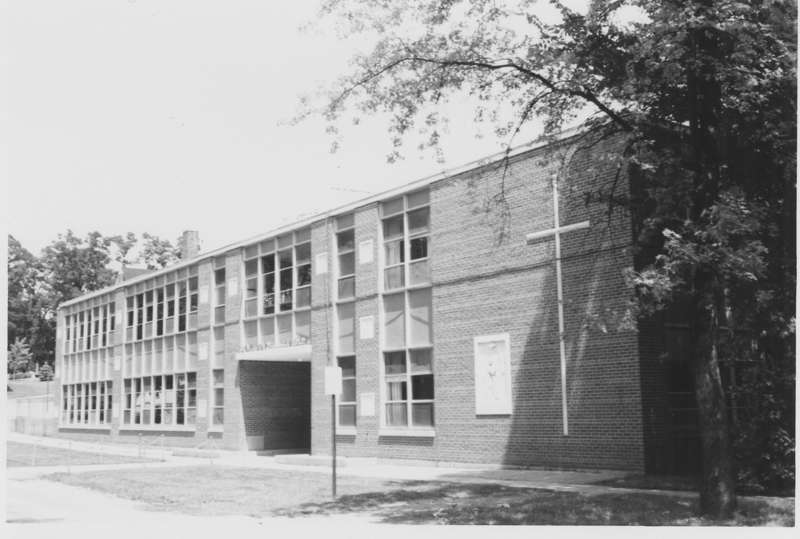 The congregation of St. Andrew Lutheran first met at the Gary Elementary School in 1959, with Rev. Robert L. Anderson as the pastor. After seven months as a mission it was organized as the St. Andrew Evangelical Lutheran Church in May, 1960. Rev. Paul Benson, who left in 1973, became pastor in 1962. He was followed by Rev. L. E. Engel who accepted another church call in January 1982. The present pastor is Rev. Michael Bostian. An extensive building program was completed a few years ago. The church is located on the corner of Geneva (East Washington) and Prince Crossing Roads. 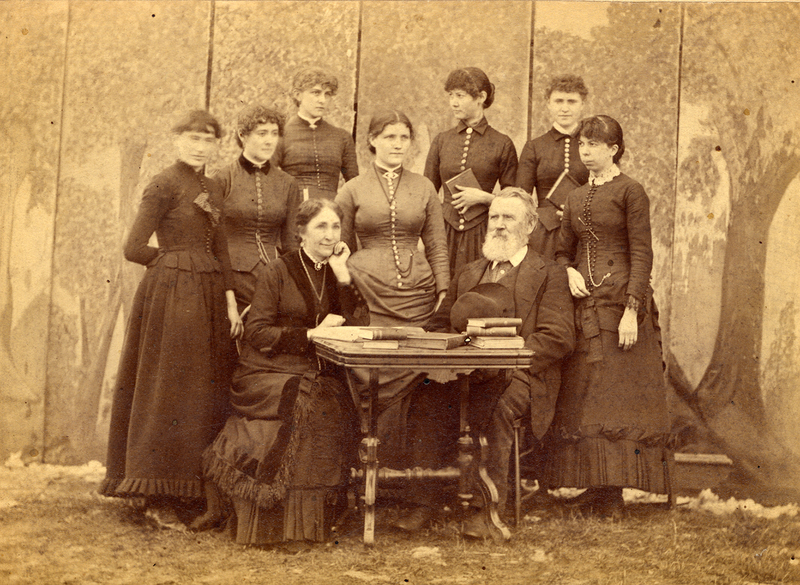 Faith Community Church of West Chicago had its inception as a Sunday School class taught by Dr. William C. Perkins. 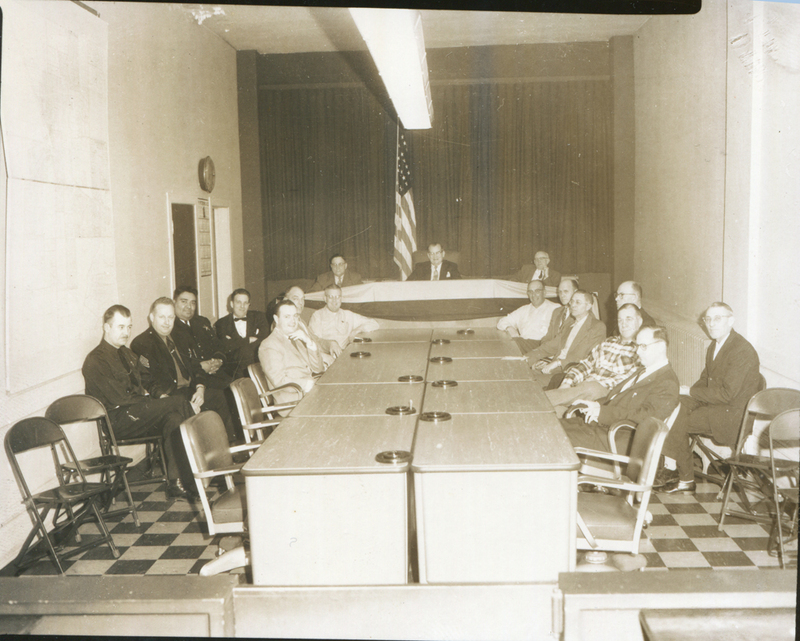 This group met for the first time in October 1973 in the meeting room of the West Chicago State Bank on West Washington Street. Later in the year the group voted to organize as a congregation of the Reformed Church in America. In June 1975, the new congregation called Rev. Harmon R. Wierenga, of California, as its first pastor. For the next five years the congregation held its worship services in Turner School and social activities were conducted in the bank building and the Easton Park Club house. As a result of a financial gift, the parsonage and 2 ½ acres of land at Prince Crossing Road and Hillview were purchased in 1975. Ground was broken on December 1, 1980, for a 5,500 square foot multi-purpose building to be built on the acquired land. The first service was held in the partially completed structure on June 28, 1981, and after completion the church building was dedicated on November 15, 1981. The construction cost approximated $300,000. Rev. Wierenga remains as pastor. The membership of Hope Evangelical Lutheran Church first held their worship services in Indian Knoll School for some years after organizing in 1973. 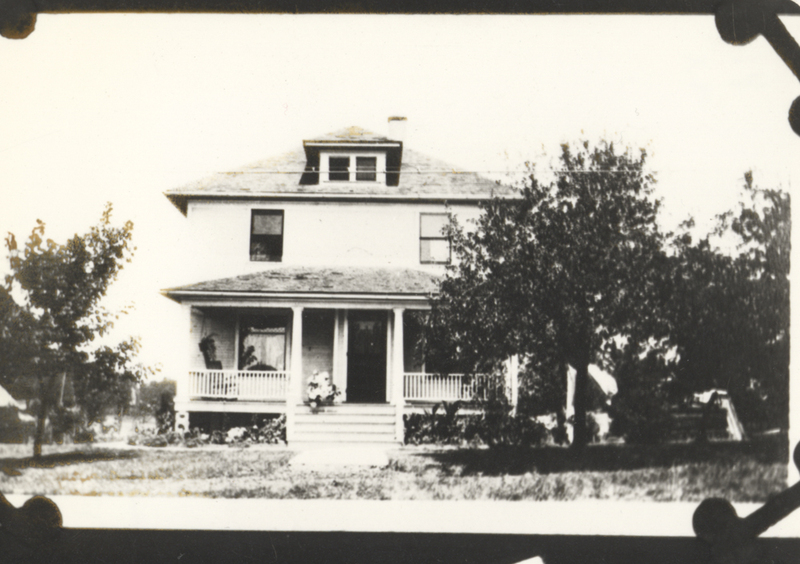 When land was purchased on Joliet Street and Rte. 59, the congregation built a parsonage and acquired a modular unit chapel from a Wheaton church and moved it to its present site late in 1978. After landscaping and remodeling of the chapel's interior was completed, 1979. A new permanent church building is planned for 1984. The Rev. James R. Ziesemer is the current pastor. The Nichiren Shoshu Buddhist Temple at 1 S 100 Rte. 59, is the area's newest worship structure and serves a number of Midwestern states. The temple, which opened in June 1981, is presided over by Priest Shudo Sugano, formerly of Japan. English services are held at 10 a.m. every Sunday, except the third Sunday when Japanese services are held. Sunday evening adult classes of the Baha’i Faith are conducted at 424 West Washington Street. Members of the West Chicago Christian Church now meet at Indian Knoll School. Donald Walters is pastor of the new congregation. As with Chapter 5, keep in mind as you read this history of West Chicago's schools that these words were written in 1984. The demolition in 1969 of the 1962 abandoned Washington School ended an educational span here – as far as brick and stone is concerned – that began a century ago. The old Turner School was constructed in 1873, replacing a frame school house which was deemed inadequate for the educational needs of that time, and re-built into Washington School in 1908. The frame structure at 219-221 Fulton Street was later sold and 126 years later it still serves as a dwelling. 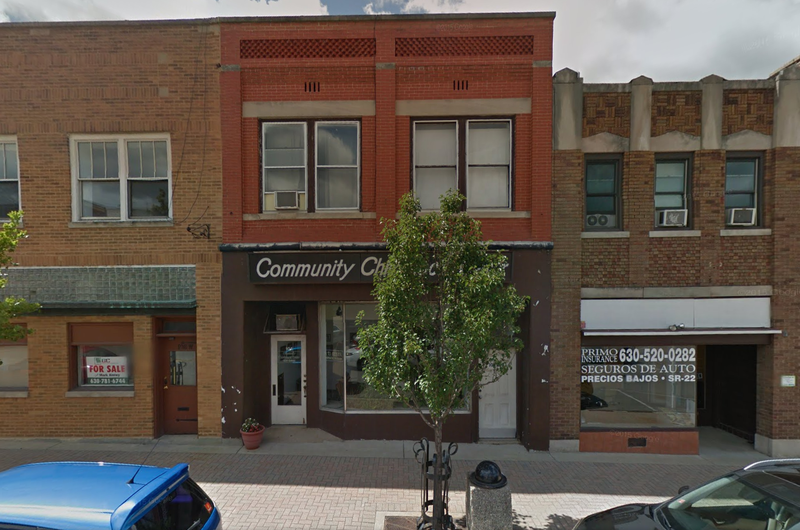 It is probably the oldest building in West Chicago. When today's Geneva Road was laid out in 1845, its route from Glen Ellyn west to the Roosevelt Road terminus made possible the location and erection of a number of new district schools, some of log construction. One such crude school, according to earlier historians, was located on the north side of Washington Street and west of Garden Street. There is no record, however, of anyone selling or donating land for school sites in West Chicago prior to 1857. With the coming of the Galena & Chicago Union Railroad in 1849 and the settlement that followed, John B. Turner permitted the erection of the new frame school house on his unplatted land, bordering Washington and High Street, and which took several years to complete and furnish. The building was also used for religious services. 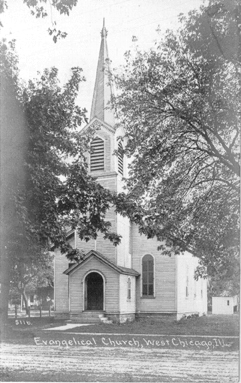 Soon after platting the Town of Junction in 1855, Turner deeded the old school site to the First Congregational Church for their intended church edifice. In 1857 he deeded lots 1 and 2 in Block 5 (on Fulton Street) to the school directors and in that year the third school house was erected. The Methodists held religious services here before their church structure was built in 1858. A Decade later the school officials made plans for a new school building, but it was not until 1873 when the first brick and stone school building was erected. The location was in Dr. Joseph McConnell's townsite and he was paid $700 for the land, and the construction cost $25,000. 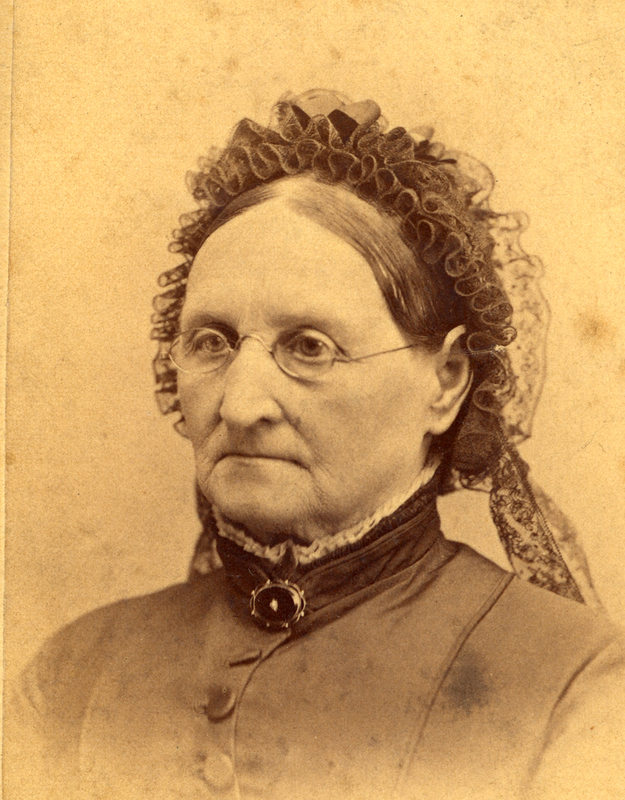 Miss Harriet Yakeley, the second principal of the new school, was responsible for many educational improvements and innovations, and introduced the first high school courses here. 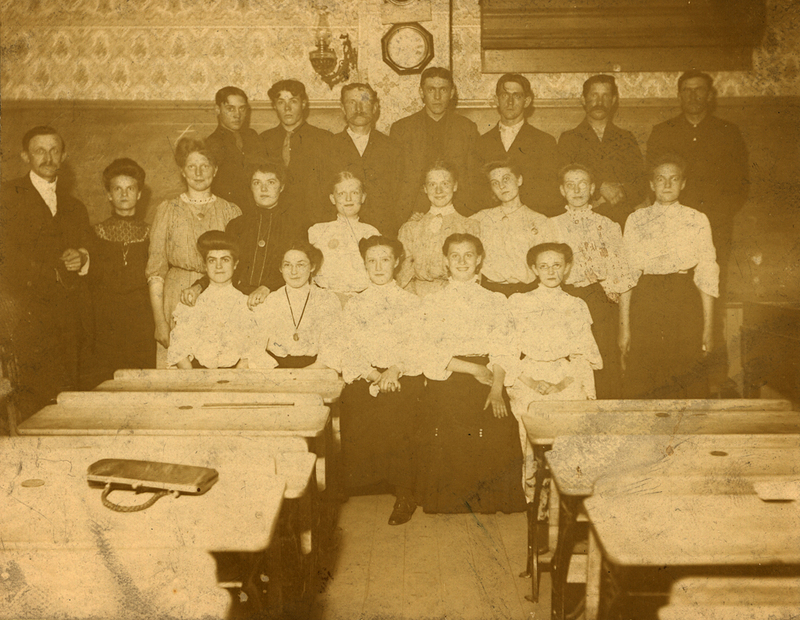 The first high school graduating class in 1878 consisted of Misses Carrie Roundy and Addie Evenden, and both became teachers here. During the 1880's Turner's development was on the move and its population also increased. So did the need for more educational facilities. In July, 1887, the voters, by a majority of 41 votes, approved the construction of a new two-story 35 by 40 feet school of brick and stone. Charles S. Winslow, the son of a pioneer settler here, was paid $500 for the land. Work on the structure began in August and by December classes were in session. 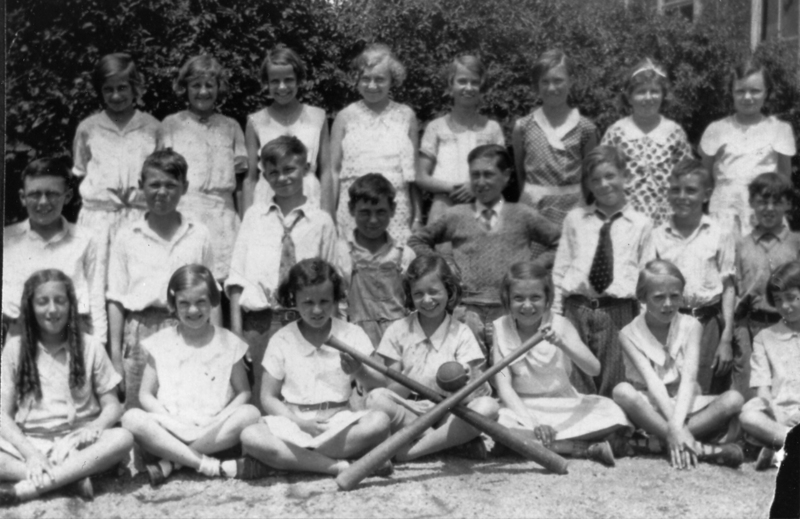 The school, known as the South Side School, was destroyed by fire in 1919, and in later years, the American Legion Post had the fire debris removed from the former school site and converted it into a recreational field. 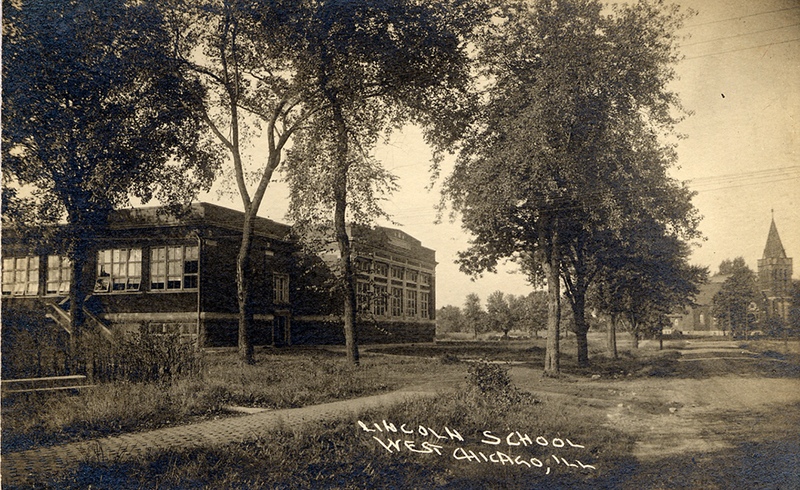 As a replacement to the burned-out school, Lincoln School on Geneva Street was built as an eight-room structure in 1921, just south of the former school. Now the oldest District 33 School, it has required the addition of two rooms in 1951, five in 1959, and six more in 1964. The West Chicago Community High School District 94 was established in 1904, with classes held first as the South Side and then at the North Side School until the new high school was built in 1926. Voters in 1925 favored the Winslow land – the school's present location – over the Reese or Harvey property of fifteen acres north of Grand Lake Boulevard and east of Arbor Avenue by a majority of 385 votes. From a bond issue of $140,000, a sum of $23,750 was paid for the 12 ½ acre tract of land. The final construction figure was much higher. Additions were made in 1956; in 1964, construction which practically doubled the size; and in 1978, when the swimming pool and other facilities were added. 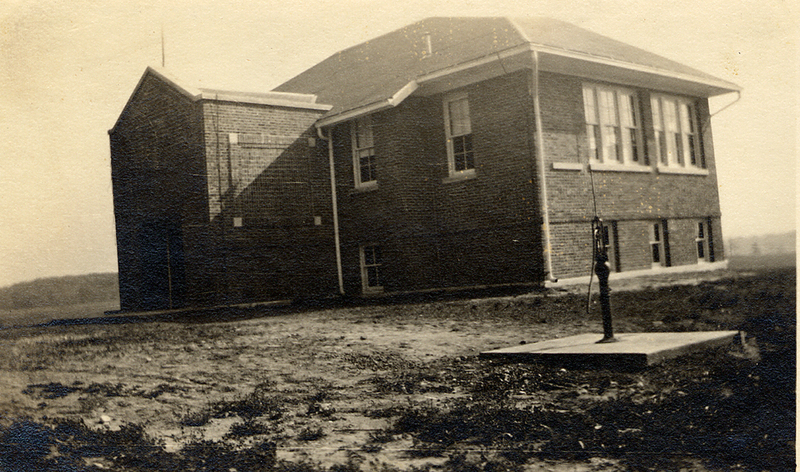 Except for a small kindergarten school of frame construction in the late 1930’s, no new school buildings were erected until 1952, when the Carrie E. Roundy Kindergarten was built just south of the Methodist Church. 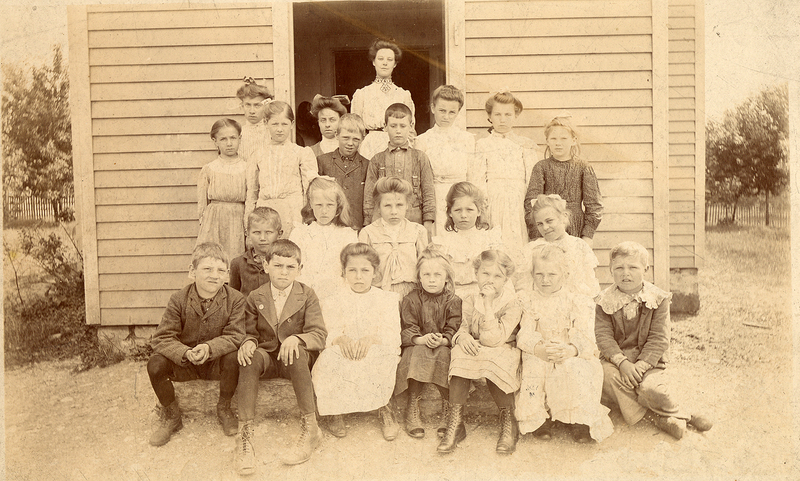 It was named after a dedicated teacher who taught first and second grade here from 1877 to 1928. It closed in 1979. 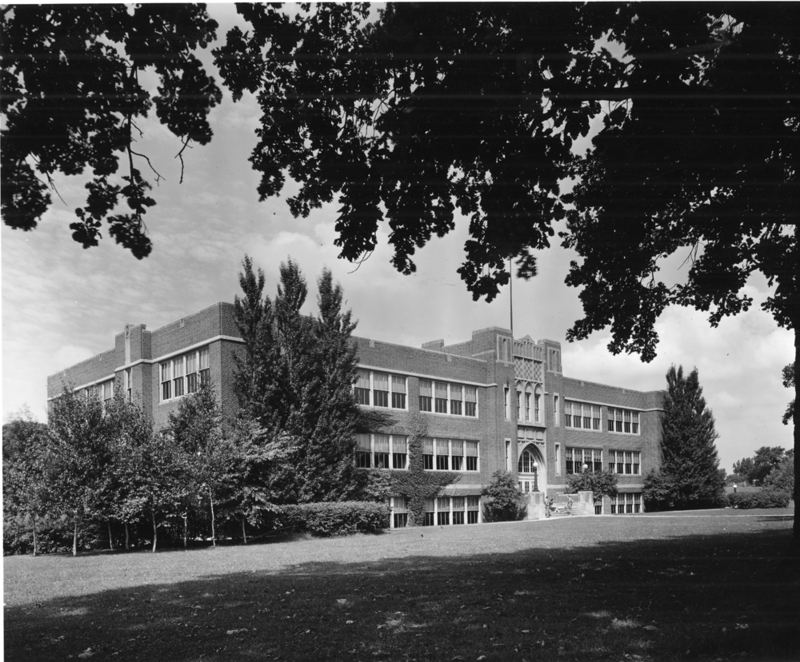 In 1952, construction began on Turner School, named for the early railroad executive. Located on Ingalton Avenue, it opened in 1953. In 1954, Gary's Mill and Round Grove school districts were annexed, followed by the Ingalton school district. 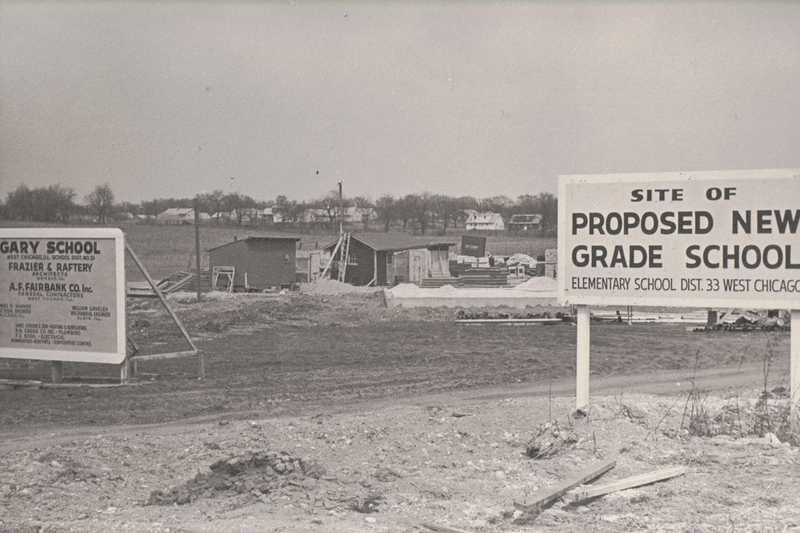 In 1955, construction began on Gary School, named for the Gary family, early Winfield Township settlers. Originally a 12 room school, it had three rooms added in 1970. 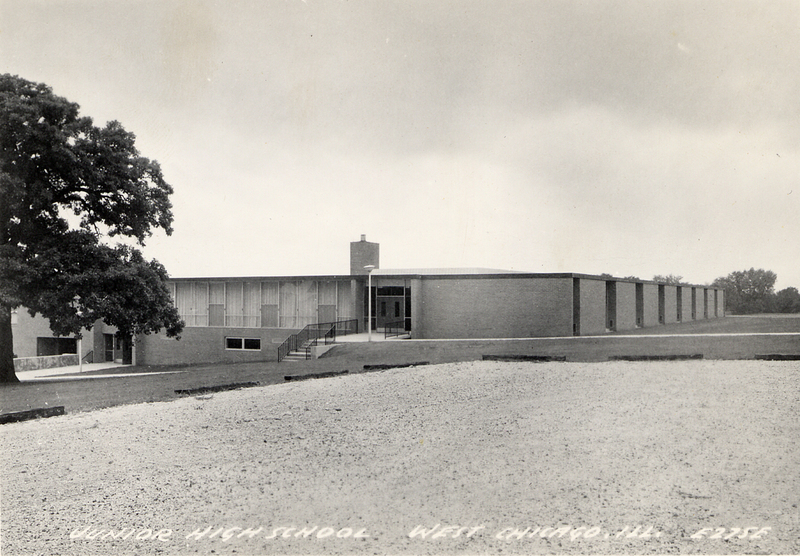 The West Chicago Junior High was built in two phases from 1962 to 1964. 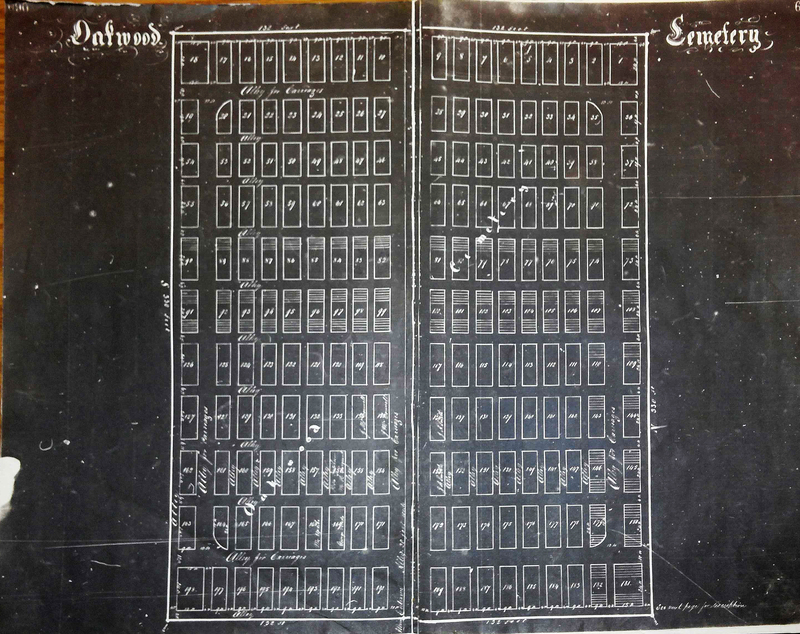 In 1971, 8 classrooms were added to the original 14. Indian Knoll School was opened in 1967, following a $450,000 bond issue, while Pioneer School was opened in 1971 through a $625,000 bond issue. 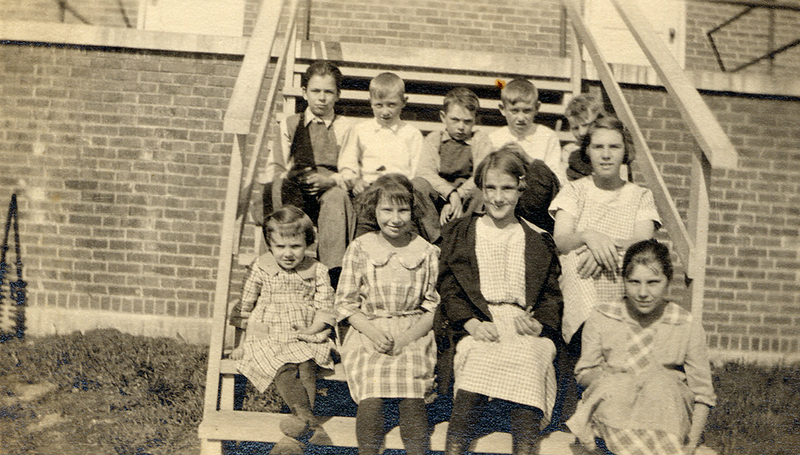 The first St. Mary's Parochial School was built in 1922, and a new eight room school, facing Garden Street and costing $203, 673, was built and opened in 1955. This concludes the original text of Chapter 6 from the Scobey and Musich book. However, one more historic school in West Chicago should be pointed out, if for no other reason than to raise awareness for the efforts to save it. 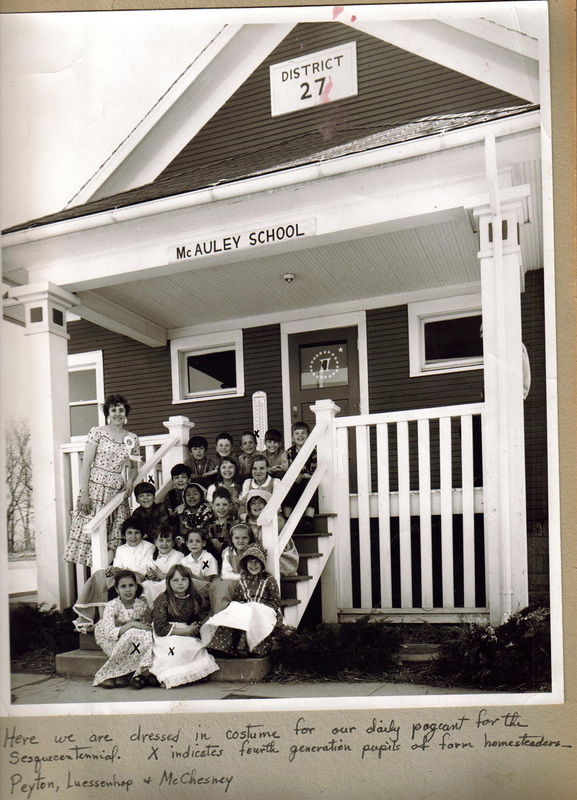 McAuley School is listed as one of the top-ten most endangered historic sites statewide. To learn more, see the Save McAuley School Facebook page. More than ninety years ago the Oakwood Cemetery grounds were reported as being in a badly neglected condition. With the passing of years the cemetery's sad plight continued until Oakwood Cemetery was brought under the city's control and care in 1964. 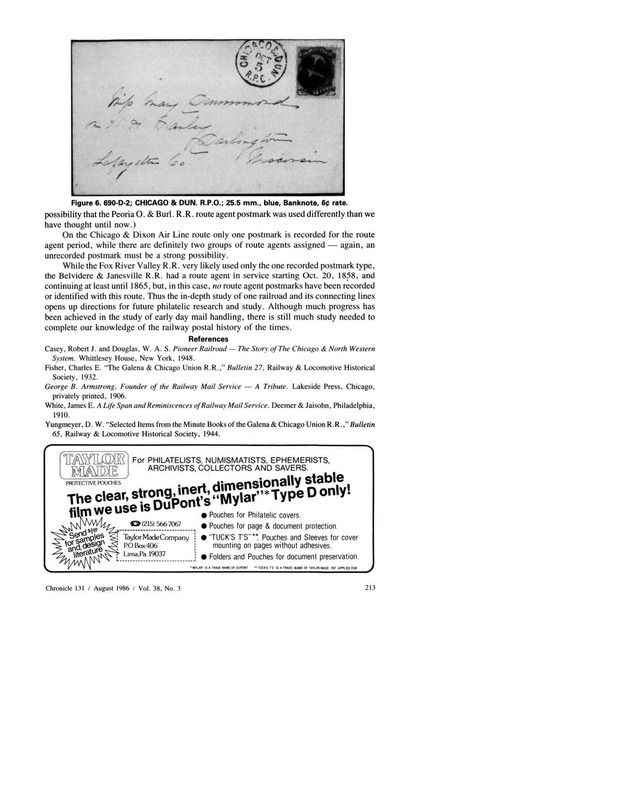 The West Chicago Historical Museum [now known as West Chicago City Museum] has transcribed and indexed the information on the cemetery's tombstones as an aid to genealogists. 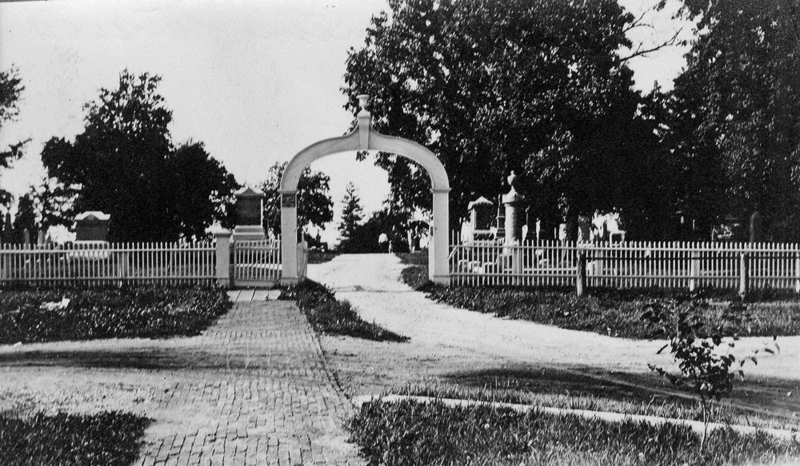 Historic Oakwood Cemetery, West Chicago's oldest burial ground, has a history dating to 1858. The land for the cemetery was donated by Dr. and Mrs. Joseph McConnell, and was platted by Johnathan G. Vallette, a surveyor, in September, 1858. The original cemetery measured 132 by 330 feet and contained 198 lots, a number of lots being larger or smaller than the regular 9 by 24 foot lots. 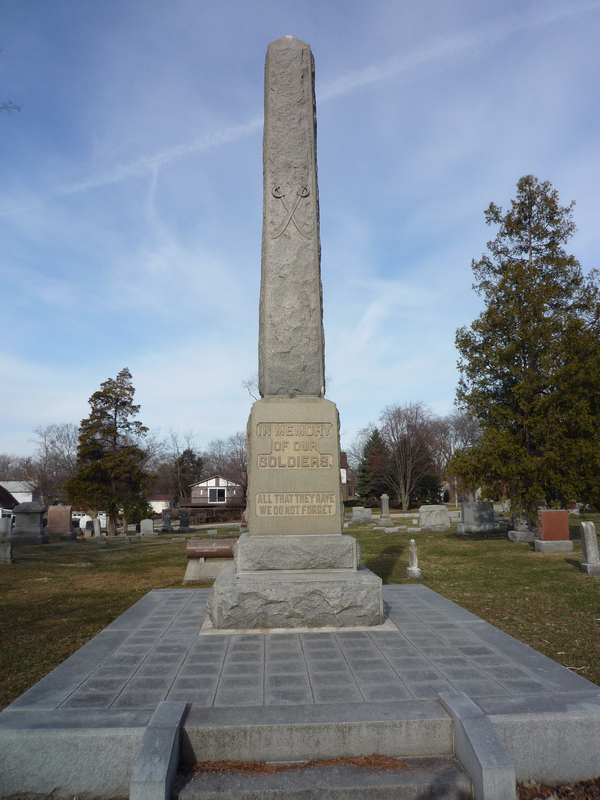 Title and management was entrusted to the Oakwood Cemetery Association, organized on Christmas Day 1858, and new officers were elected at the annual meeting held in June. 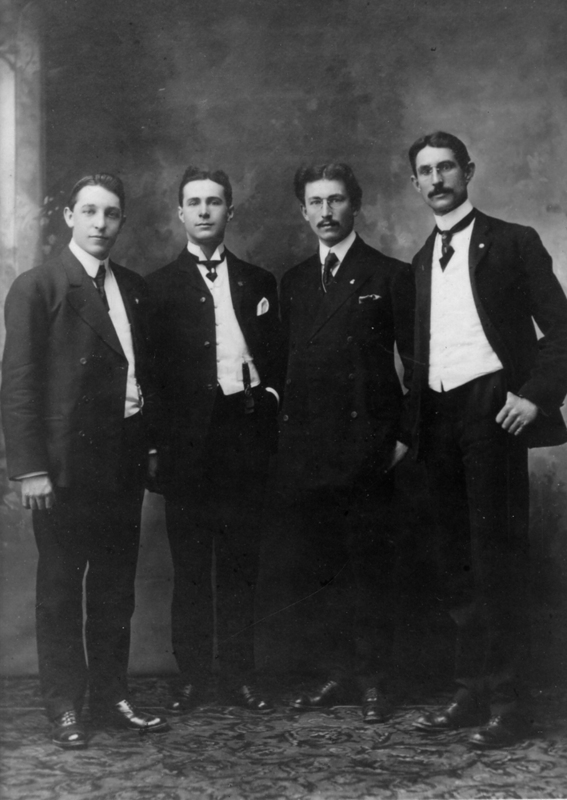 The first officers were Joseph McConnell, president; Job A. Smith, treasurer and secretary; and three directors – James Conley, Charles Winslow and Daniel Wood. It is rather pitiable that the remains of Dr. and Mrs. McConnell, donors of the cemetery land, lie there in unmarked graves. Two additions were made to the original cemetery in 1881 and 1898. The first, a tract 60 by 330 feet, contained five rows of lots numbered 199 to 253. The plat is titled “First Addition to the Oakwood Cemetery of Turner Junction, Illinois.” Although the village's official name was Turner, the informal Turner Junction name was alive in a cemetery. Surveyor Vallette who made the original plat, also surveyed the addition. The officers of the association in 1881 were President Gordon N. Roundy, and Directors Asel A. Gates, father of John W. (Bet-a-Million) Gates, John McWilliams and John M. Fessler. The second and final addition to Oakwood a tract measuring 146 by 264 feet at the northwest corner was surveyed by C. A. Prout of Wheaton in October, 1898. The cemetery association officers in 1898 were John Norris, President, and John Parker, Major J. Town and Theodore E. Tousley as directors. At one time Oakwood Cemetery's name was featured in the iron arch at the York Street entrance. The Soldiers' and Sailors' monument located there is the city's only memorial honoring the war dead. 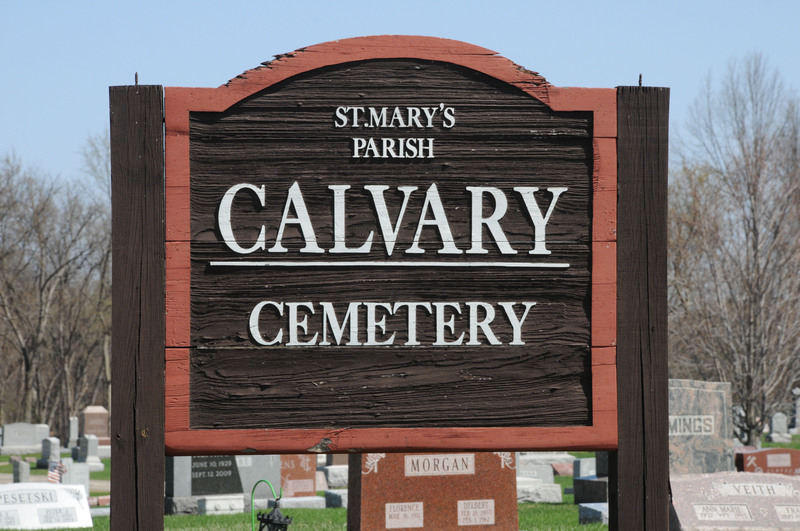 Calvary Cemetery, the city's second oldest burial ground, was developed by the Catholic diocese of Chicago in the late 1870's. 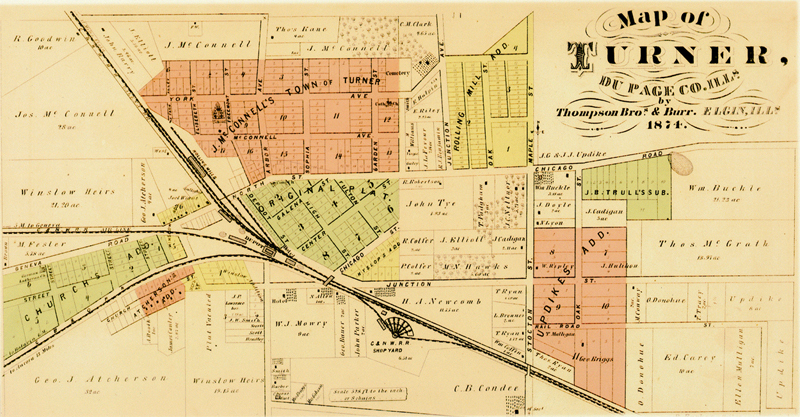 The land was originally James B. Trull's subdivision and came into the corporation limits when Turner was organized in 1873. Trull, the former landowner, and Rev. Thomas Gaffney, pastor of St. Mary's Church who lost his life in 1914, are both buried here. A cemetery with a short existence was the former Highland Cemetery about two miles east of West Chicago. It was situated on the northeast corner of Geneva and Indian Knoll Roads. The planned cemetery was divided into four large sections, and the entire area measured 689 by 1361 feet, with over 2400 lots of 16 by 16 feet size. It was platted in March, 1893, and the few who were buried were removed and interred elsewhere. The City of West Chicago became the owner of Glen Oak Cemetery in 1916, during the administration of Mayor William R. McGrath. 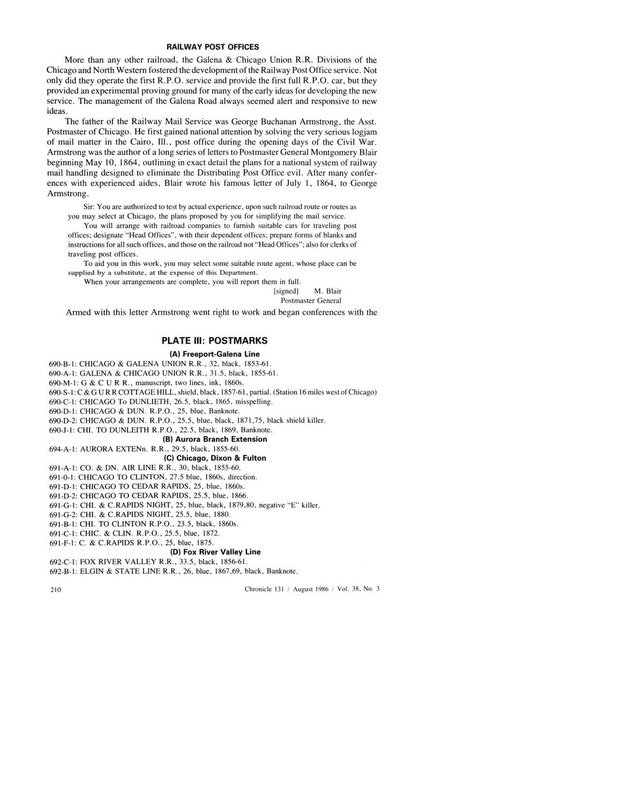 It was surveyed by E.L. Gates, and the original plat contained 204 lots. The city-owned cemetery was annexed to West Chicago in 1964. 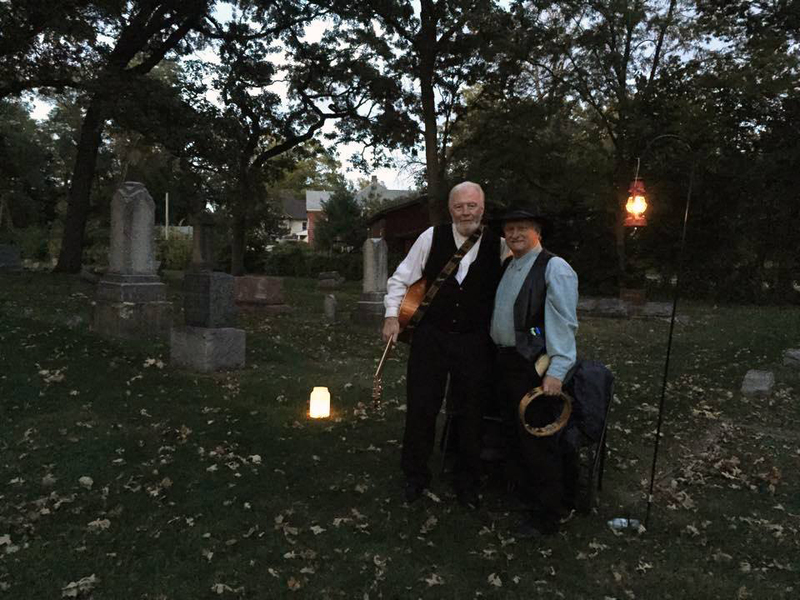 If you enjoy learning about the history of Oakwood Cemetery and the early settlers of West Chicago, be sure to check out our Tales Tombstones Tell program held every October. Each year we feature a new host of founding fathers and mothers presented by costumed interpreters. 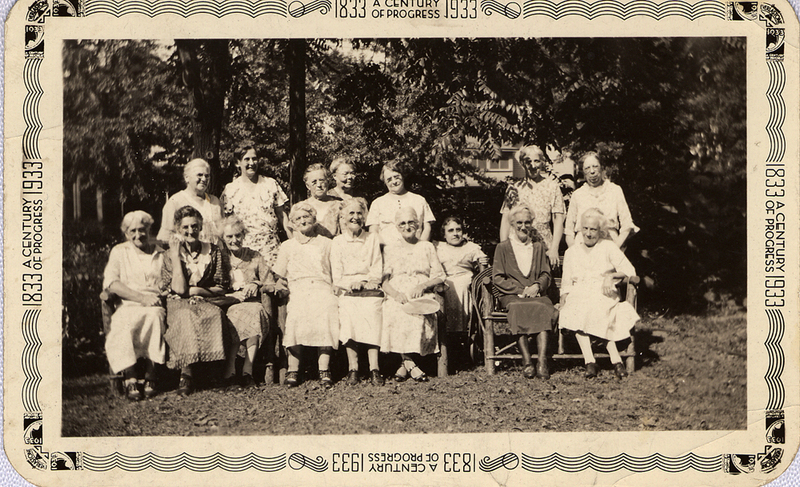 The first census of this community was taken in 1860 – or the Eighth United States Census. At that time there was no local government, and Turner or Turner Junction was under the township form of government. There were 148 dwellings counted in an area without specific boundaries but which were listed under Turner Post Office, and the unofficial population was 722. In the 1870 census, the dwellings increased to 222 which were listed under Turner Post Office, and the unofficial population was 1,086. When the village was incorporated in 1873, with the village boundaries duly defined, the population decreased to 850. 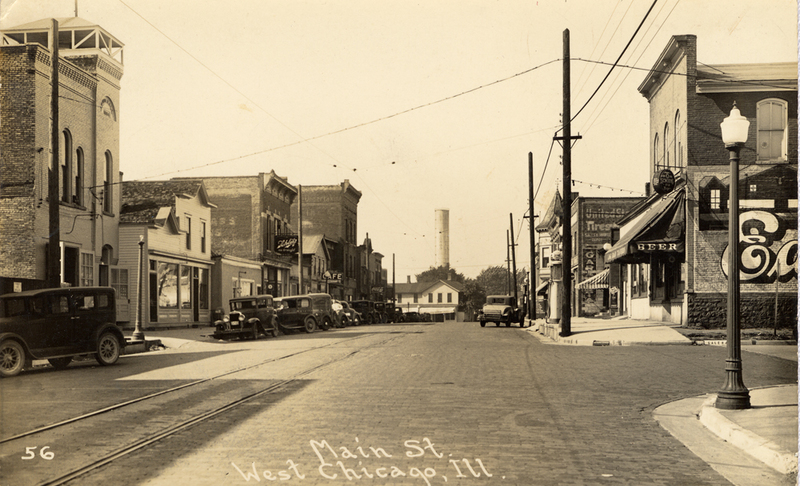 The population figures for the Village of Turner, the Village of West Chicago, and the City of West Chicago showed a continuous gain for the past century, the only loss of population recorded in the 1940 count. Beginning in the 1950's, there were several official recounts. 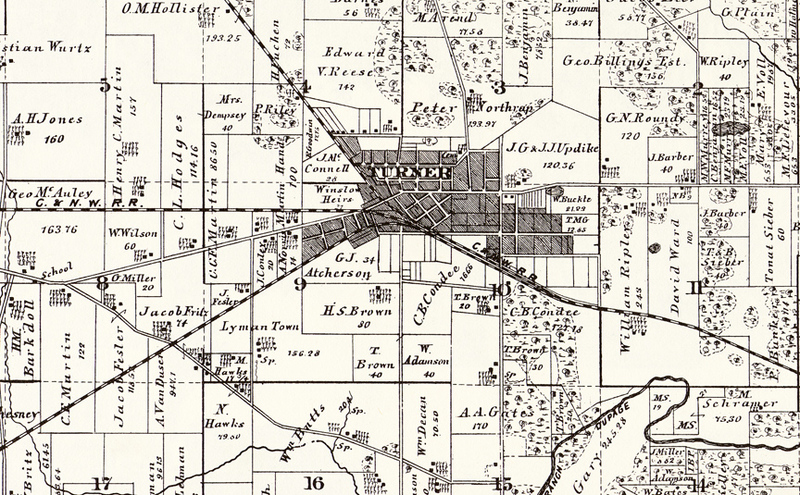 Detail of an 1874 map of Winfield Township that shows Turner (now West Chicago). *Right click and "view image" to see a larger version of these images. Ripley Hotel, now 200 Main Street, c.1880. 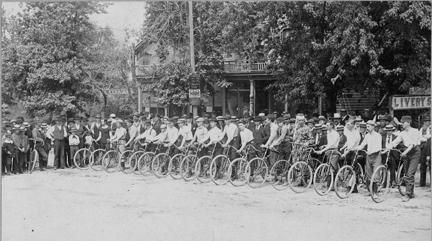 Turner Wheelmen Bike Race starting line at Washington and Main Streets, July 4, 1895. 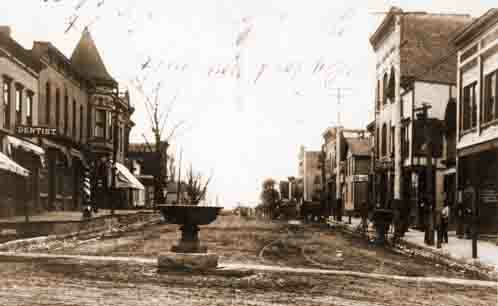 The Woman's Christian Temperance Union fountain in its original site at the intersection of today’s Main and Washington Streets, circa 1900. The view is looking south down Main Street. 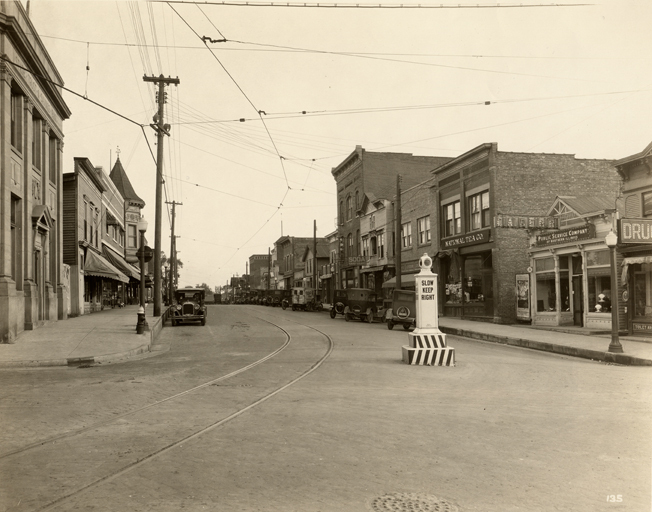 Main Street looking south, circa 1915. 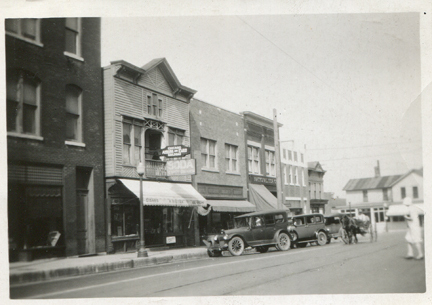 Main Street looking south, c 1930. 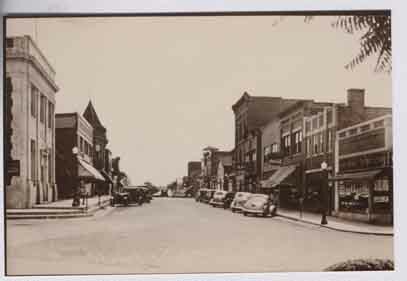 Main Street looking south, circa 1940. 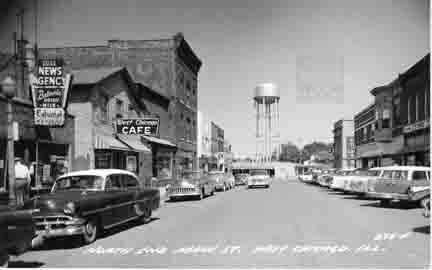 Main Street looking north, circa 1955. 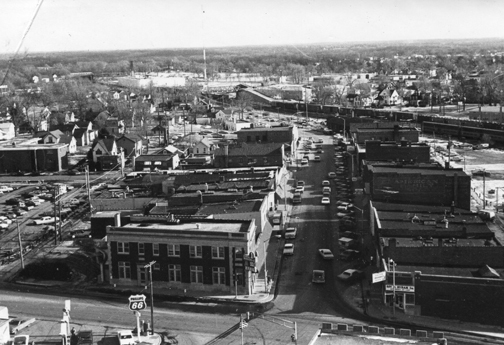 Main Street looking south, circa 1963. Ariel view of Main Street, circa 1970. 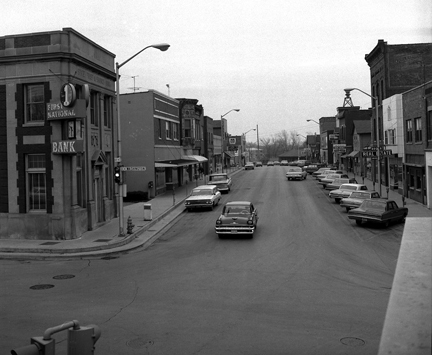 Main Street and Washington Street, circa 1973. 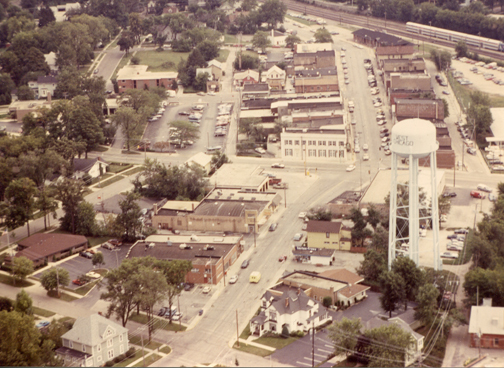 Ariel view of Main Street and Washington Street, circa 1985. The names of streets, as a rule, can be traced to the real estate developer's plat. In the case of West Chicago, this time-honored custom goes back to John B. Turner's 1855 plat of the Town of Junction and Dr. Joseph McConnell's Town of Turner, platted in 1857, and to other parcels of land platted since then. The original land plotted by Turner himself as Town of Junction is labeled "Original Plat." The McConnell land, platted as Town of Turner, is labeled as such. Mr. Turner, the president of the Galena & Chicago Union Railroad, named three streets after the three Illinois cities that were projected as the terminal points for his railroad: Chicago, Fulton, and Galena. Center Street was so named because it lay at the center of his original plat, while North Street (today's Washington Street) formed the plat's northern boundary. The renaming of three streets here by city council action on July 7, 1930 was long overdue. The old name Depot Street gave way to the commercial-sounding name Main Street; Railroad Street became Hillview Avenue; and perplexing North Street was christened Washington Street, as this street had ceased to be the north boundary of the community some 73 years earlier. 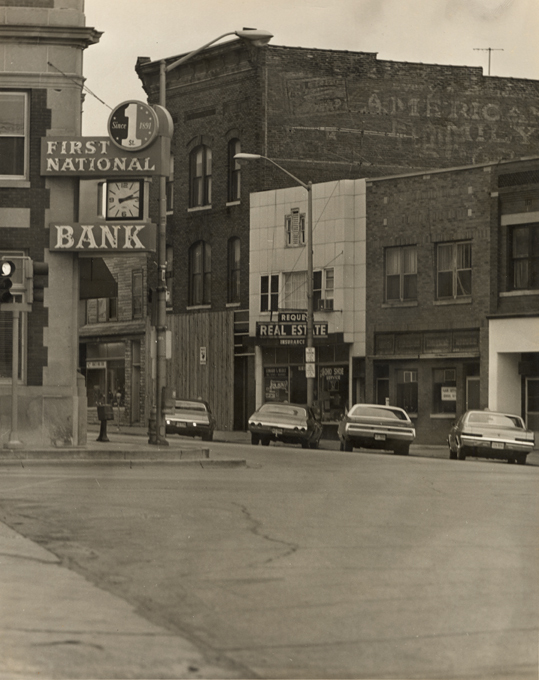 View on Washington Street when it was known as North Street. In the left foreground is the Acherson Building, which still stands today. 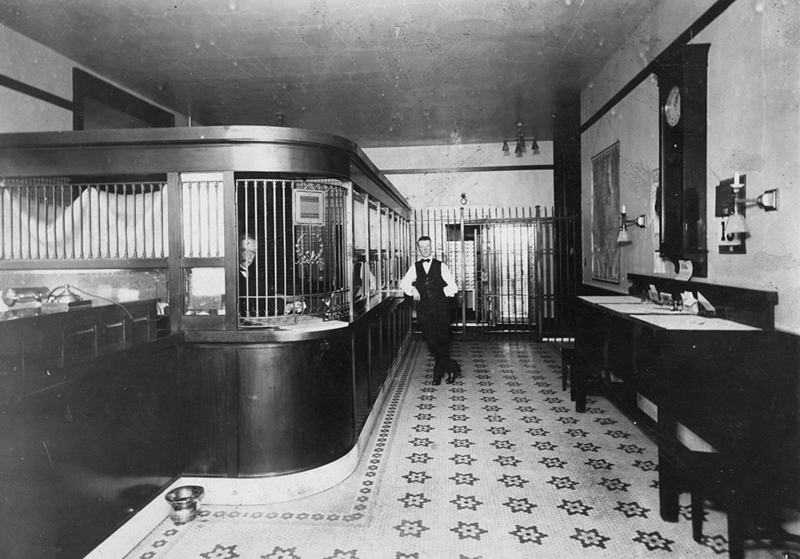 At the time, it housed State Bank. An ordinance enacted in 1931 renamed another street here in honor of a venerable and highly-esteemed citizen, John C. Neltnor. Thus Maple Street, boasting a few trees of that species, was renamed Neltnor Boulevard, although the boulevard part is questionable since the street is the busy four-lane State Highway 59. John C. Neltnor, for whom Neltnor Boulevard was named. 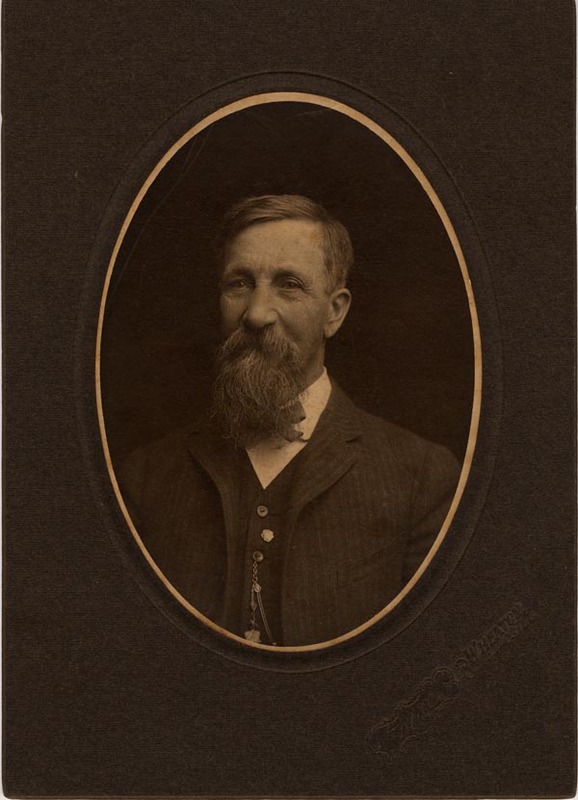 In his time in Turner, Mr. Neltnor (1841-1938) was a local businessman who owned and operated Grove Place Nurseries, postmaster of Turner (present day West Chicago), and editor and publisher of the DuPage County Democrat. Mr. Neltnor is buried in Glen Oak Cemetery on Arbor Avenue in West Chicago. In the intervening years, other streets were renamed and are now known as Bishop Avenue, Weyrauch Street, Hahn Place, Tye Court and Fawell Drive, to name a few. A number of street names in old plats have disappeared and are now forgotten. 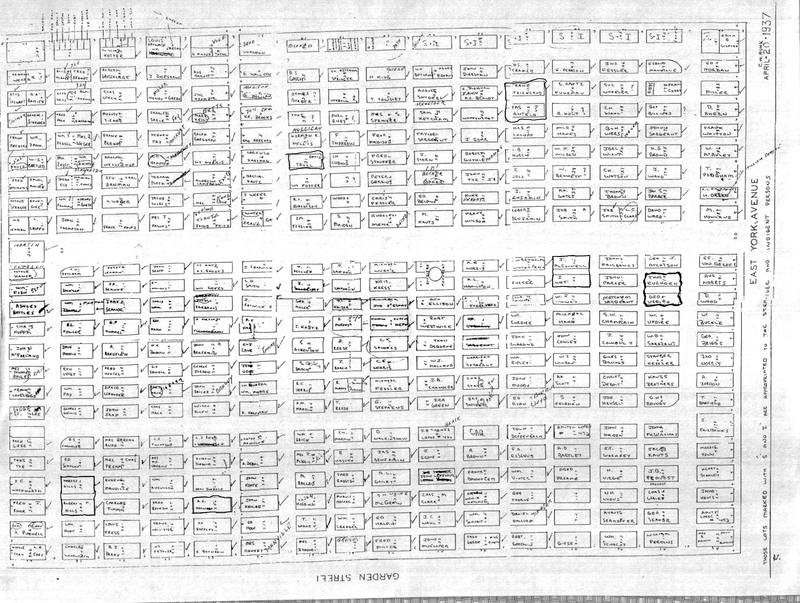 In the spring of 1930, superintendent of Public Works Frank E. Schacht presented an improved plan of house renumbering to the city council; it was later approved. 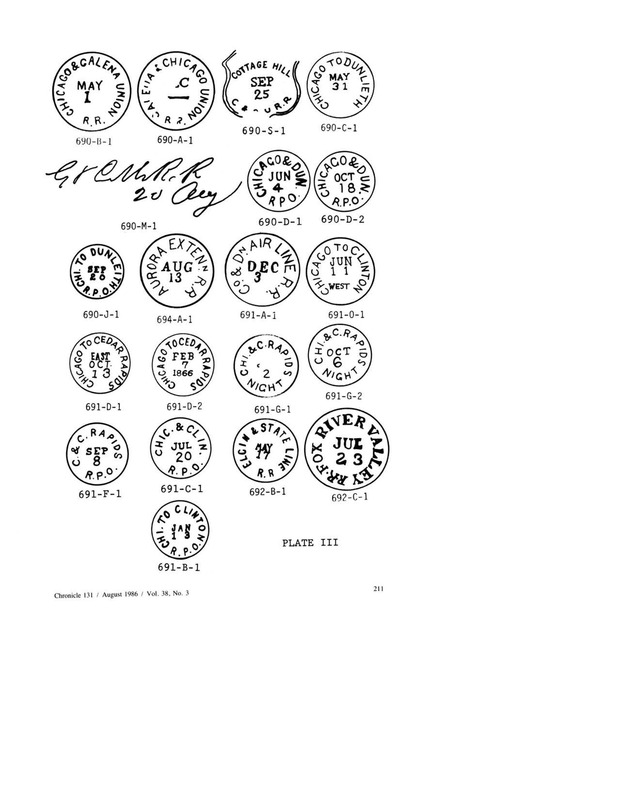 In the old numbering system, numbers on any given street ran consecutively from one upward, with no distinct number change at the end of each block. Thus, the Address 24 could, for example, be on one block and 26 on the next. The new system numbered each block by the hundreds – first block of a street was the 100 block; the second, the 200 block; and so on. It was contended the new numbering system would never need to be changed again. When the Village of Turner was formed in 1873, one of the most pressing needs of the community was a jail. An ordinance authorizing $500 to purchase a lot and building for a jail was passed in 1876, but it wasn’t until 1884 that construction began on the Italian Villa style structure. The Turner Town Hall was not only the governmental nerve center, but the first home of local police and fire departments and the public library. A light on a post above the building’s tower summoned the constable as he made his rounds in the downtown area. The building also operated as a cultural center for the nineteenth-century village, and hosted bazaars, art exhibits and monthly dances. It was in use by village and city government until 1975, when space limitations forced a move to larger quarters at 475 Main Street. In 1976 the building became the home of the West Chicago City Museum and is the repository of local records dating back to the 1840s. Due to its importance as a civic and political center for the Village of Turner, it was placed in the National Register of Historic Places in 1991. It has maintained a public use for the last 127 years. The plans for the Town Hall, later the City Hall, were made by John Norris, a well-known building contractor and village president in 1884. Construction began in June, 1884, at a cost of about $6,000. The primary carpenter for the construction was Albert Hills, who was born in Bethersden, England in 1837, and came to this area in 1865 after emigrating to the United States in 1849. The first village council meeting in the new structure was held on May 19, 1885. In attendance was the new board of trustees – S.P. Tillotson, village president (a locomotive engineer), Thomas Wiant, Frank Whitton, Thomas McGuire, John Kruse and John Barber. They met in the finished portion of what one writer dubbed “a rookery.” It took another year before the structure's interior was completed. 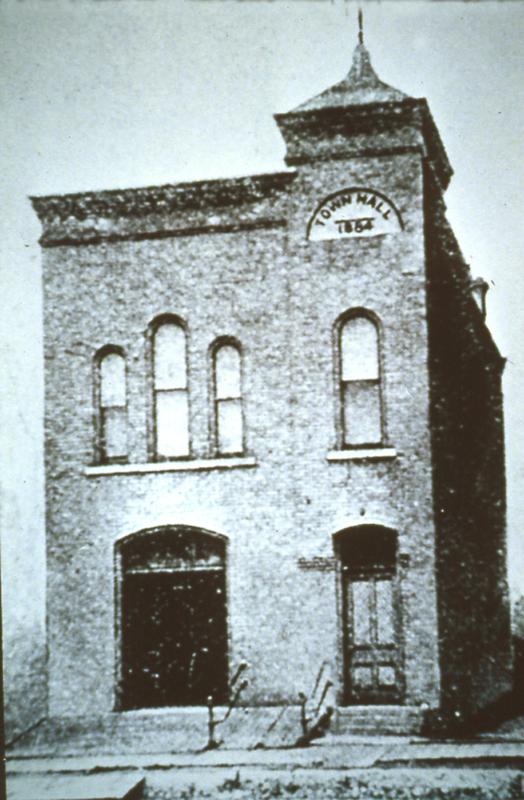 An early photograph of the newly completed Turner Town Hall. 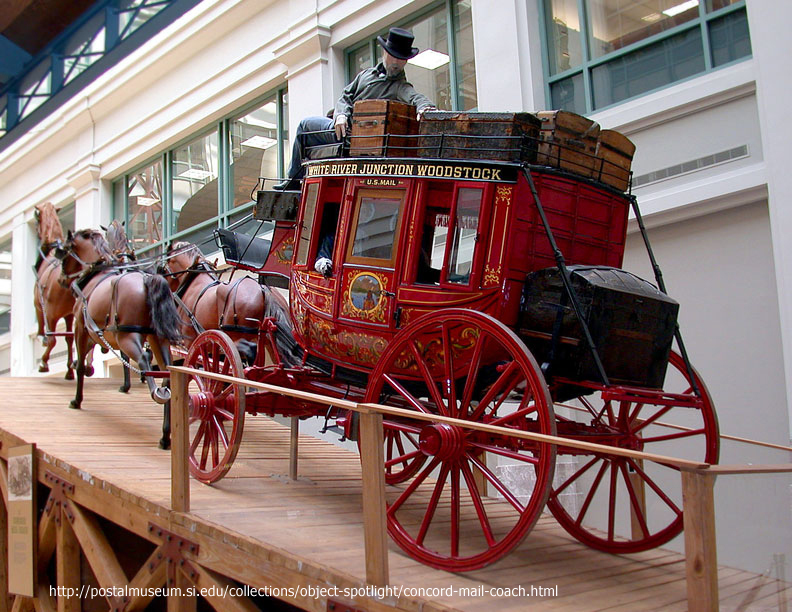 In 1887 it housed the first four-wheeled hook and ladder truck or vehicle, while the West Chicago Hose Company No. 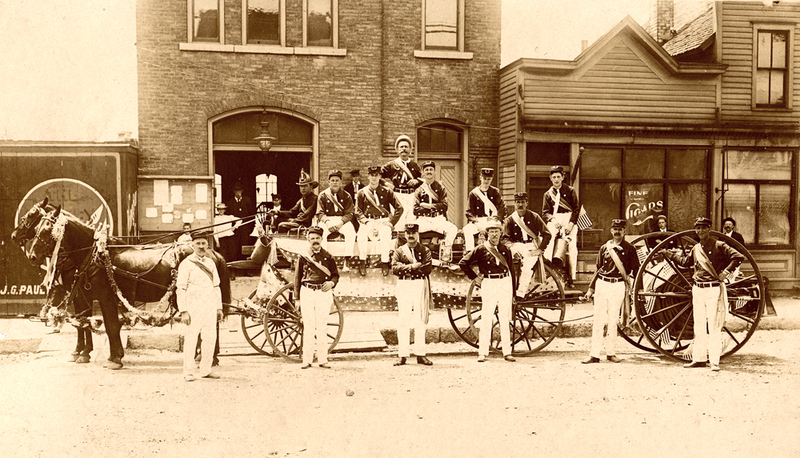 1 and the Hook and Ladder Company of the old volunteer fire department were organized in 1896. Besides the fire department, the building also housed the police department for many years, including a lock-up cage in the basement. The venerable landmark was not only a place for civic requirements and deliberations, but it also played a role in the community's social life and entertainment. 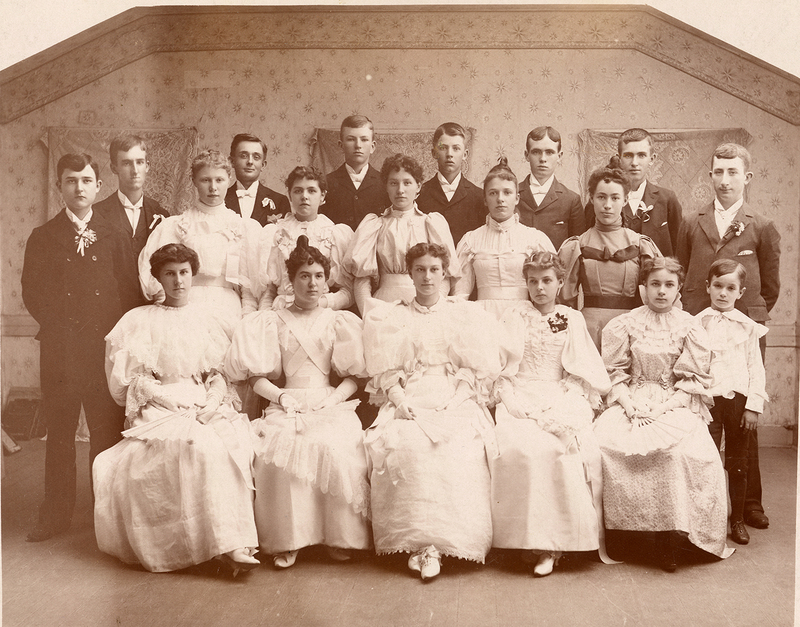 "Yourself and ladies are cordially invited to attend a dancing party to be given in Town Hall Friday Eve, Oct 7th. Dancing to begin at 8:30 sharp"
A 1956 City Council meeting. 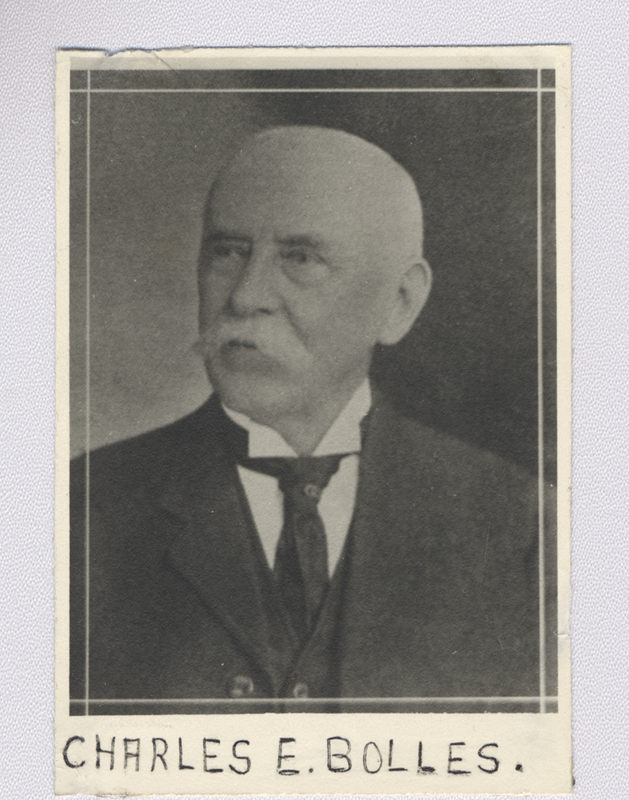 The mayor at this time was Walter R. Fawell. 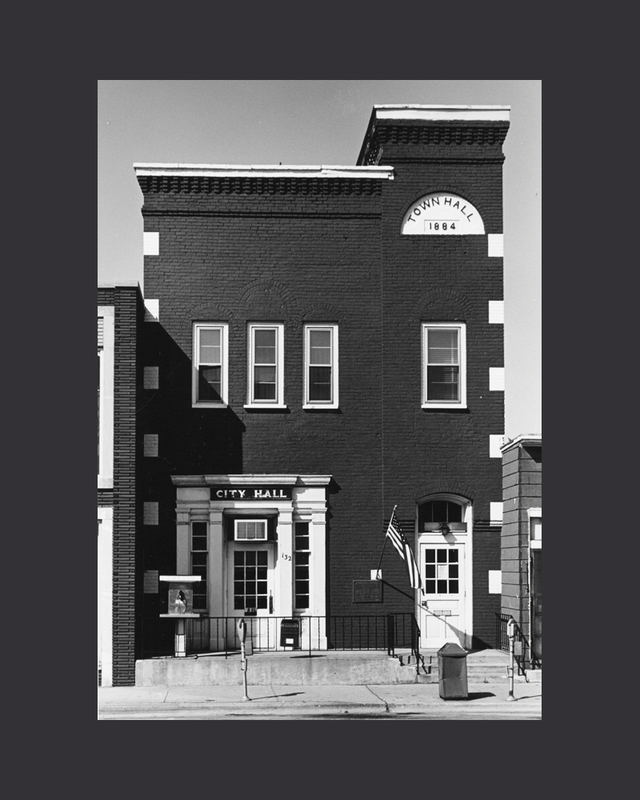 Ninety years later, in April 1975, the last city council meeting was held here, after which the city government moved to its remodeled City Hall at 475 Main Street. 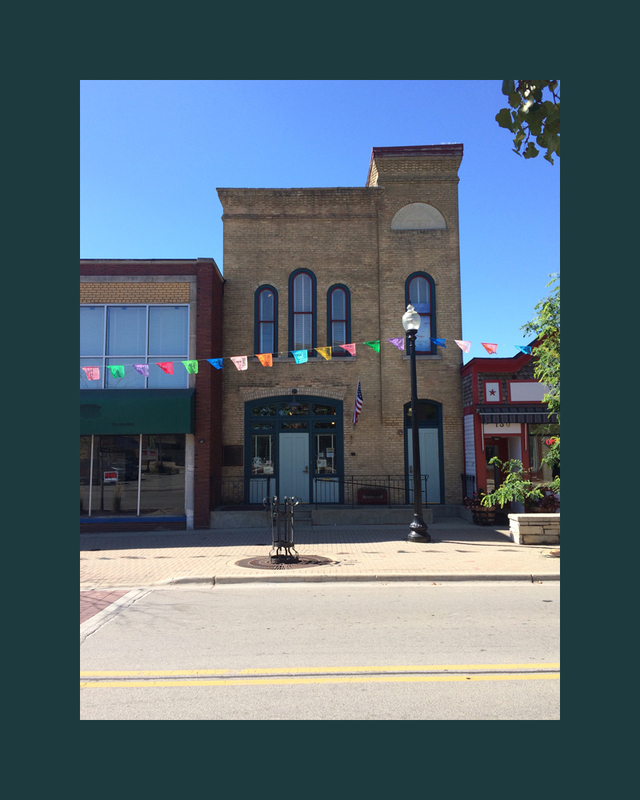 Under the leadership of Mayor Richard Truitt, the city designated the vacated building as the City of West Chicago Historical Museum. "City Hall" is posted above the entrance of the 1884 Turner Town Hall building. This photo was likely taken in the early 1970s, shortly before the building became the home of the City of West Chicago Historical Museum in 1976. Thus, the old Town Hall at 132 Main, is preserved for posterity. It will remain as a repository where the community's relics, memorabilia, and historic documents can be viewed by the generations to come. The historic landmark observed its centennial in 1984. This photo was taken in 2017. 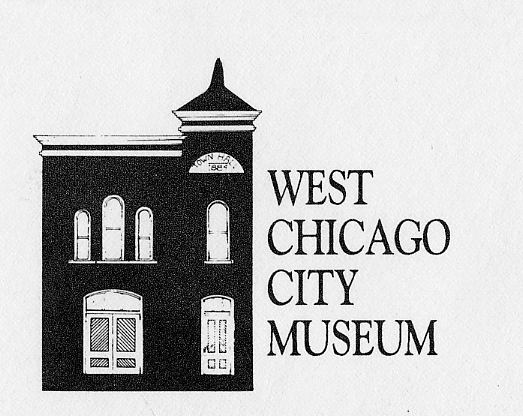 The museum's name was changed to West Chicago City Museum in the late 1990s. The agitation that suddenly sprouted late in 1895 for a change in village name, whose real purpose or reason then is still a mystery today, brought quicker results than anticipated. 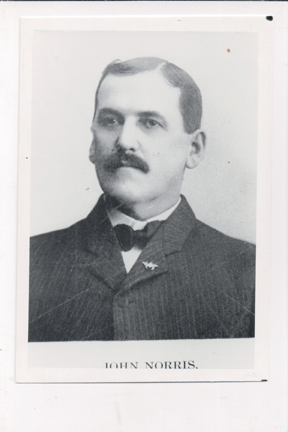 There is evidence that the name change was promoted, if not initiated, by Charles E. Bolles, a former villager who had vested interests in this community. The petition for renaming the Village of Turner to the Village of West Chicago, signed by 187 legal voters, was presented by C. E. Smiley and A. L. Hamilton to the village board at a meeting held on January 4, 1896. Smiley was a partner in the Newton and Smiley bank here, while Hamilton was editor and publisher of the DuPage County Independent, a local weekly and predecessor of The West Chicago Press. A public notice was published in three successive issues of the two local newspapers concerning the proposed name change, and the trustees also set a special meeting to be held at the Town Hall on January 25, 1896, at which time action on the petition would be taken. The village board at that time was presided over by President William T. Reed and consisted of Trustees Thomas G. Isherwood, M.D., Frank Whitton Sr., Albert E. Hahn, Thomas Mulligan, William J. Carr and Christ Kautz. Since there was no opposition, either in writing or in person to the proposal, the act changing the name of Turner to West Chicago was passed by the full village council on Saturday, January 25, 1896 and took effect that midnight. 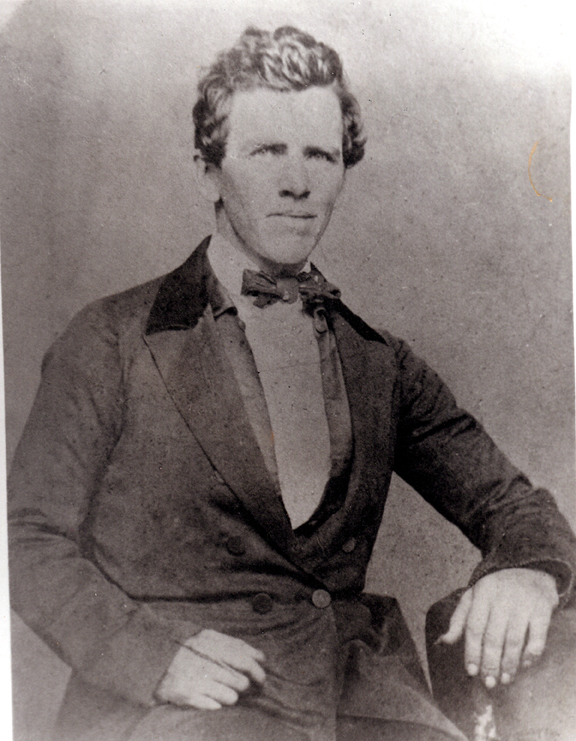 William Reed was the last President of the Village of Turner and the first President of the Town of West Chicago. He served in the Illinois 141st Infantry during the Civil War. 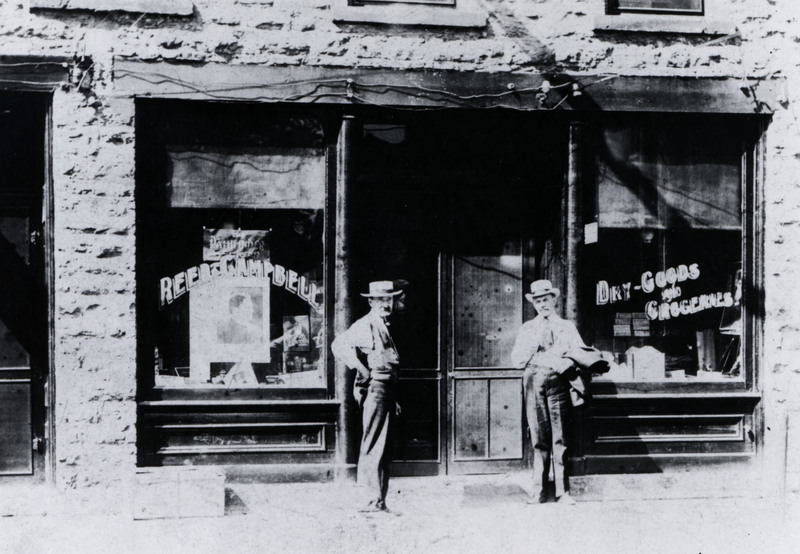 After the war he began clerking in a general store and eventually opened one of his own in 1876. William was an active Republican and served as Winfield Township Supervisor, Village Treasurer and Police Magistrate. 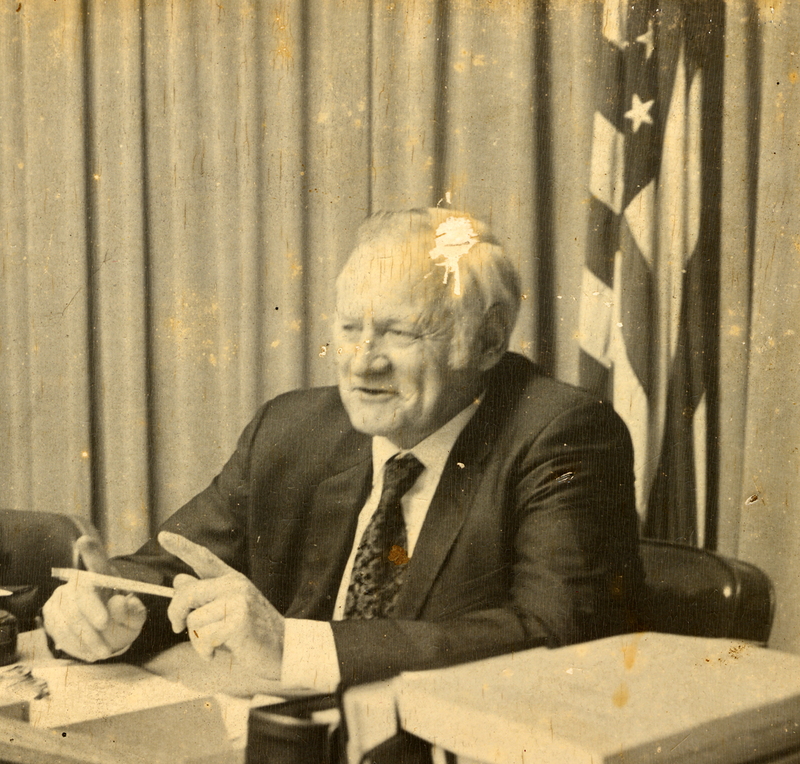 Reed was also a director of the West Chicago State Bank. PHOTO: The man on the left is believed to be William T. Reed. The industrial boom experienced in an old railroad town in the early 1890's was due mainly to the coming of a new railroad here in 1888. 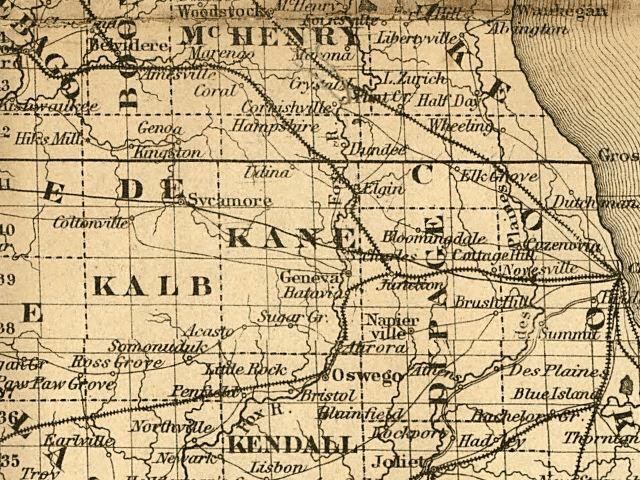 The many connecting points and the outer belt route of the Elgin, Joliet & Easter Railway made Turner, or West Chicago, a desirable site for the location of new industries, a trend that has continued to this day. This map dates prior to 1896, which is the year Turner became renamed as West Chicago. 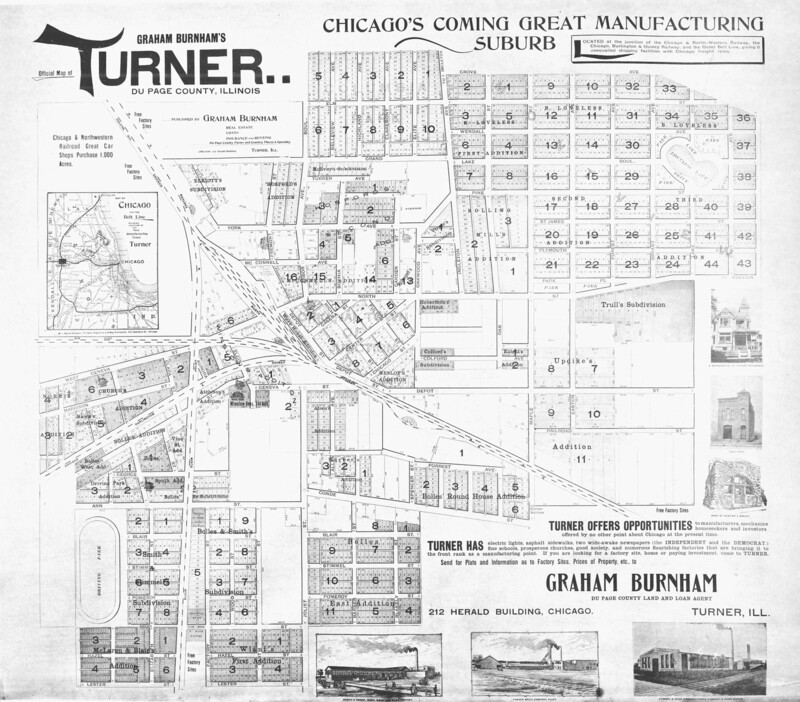 The map shows the Elgin, Joliet & Eastern, Chicago NorthWestern, and Burlington railways, touting Turner as "Chicago's Coming Great Manufacturing Suburb." The first large scale manufacturing area in West Chicago was the sector south of Ann Street and east of the “J” railroad tracks. The pump factory was the first manufactory there. 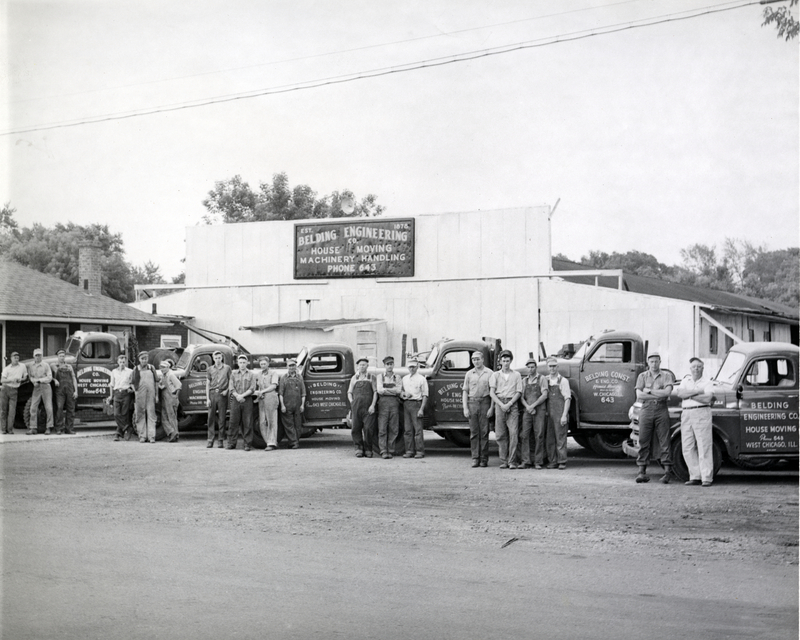 Through the years the site was occupied and subsequently enlarged by several industries, the better known being Union Tool Co., Lindsay Light & Chemical Co., and recently the Kerr-McGee Corp. The old West Chicago Sash & Door Co. and the Economy Housing Co. plants were located in the south end. To the north and northwest, where the Chicago & North Western Railway owned vast acreage, no early industrial development was undertaken. The West Chicago Stock Yards, built by the railroad company, later occupied a portion of this land. Three old-time industries, the Turner Brick Co. on East Blair Street, Borden's milk condensing plan (now the site of Jel-Sert), and the Turner Cabinet Co., were located on the line of the North Western, as the shipment of their products depended on the railroad. From 1918 to 1964 the stockyards in West Chicago provided a stopover point for livestock being shipped east from western grazing lands. The Borden's milk condensing plant was built about 1906. Since the late 1880s, West Chicago (then known as Turner) had been the site for the formation of one of Chicago's largest milk trains. Each morning the C&NW as­sembled a fifteen car milk express destined for Chicago. It drew cars from three directions and from as far away as Williams Bay, Wisconsin. Because of the volume of milk passing through West Chicago and because of the dairy farms in the area, Borden's had found this a logical spot for a milk plant. (The plant eventually became a Reid Murdock pickle plant, and later Jel Sert). The Belding Engineering Co., established in 1878, and Modern Hydraulics Inc., a neighbor of Belding's since 1958 and both located on West Grand Lake Blvd. ; the Bates & Rogers Construction Corp., whose warehouses and shipping yards here date to 1919; and the Geo. J. Ball Seed Co. on Town Road have all attained national prominence with their work and products. 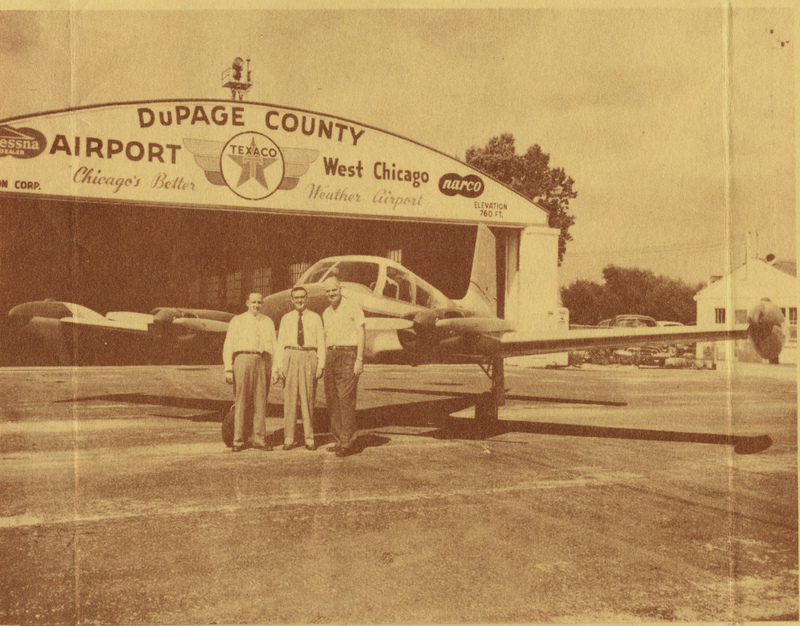 The first West Chicago Stock Yards, located in Wayne Township and comprising over 1,000 acres, was sold by John McQueen in 1928 to Chicago aviation promoters as an airport site and for flight training and manufacturing purposes. The first industry in the new industrial section on the east side of Powis Road was an airplane factory. The greater portion of the former sheep grazing lands is withing the confines of the DuPage County Airport. 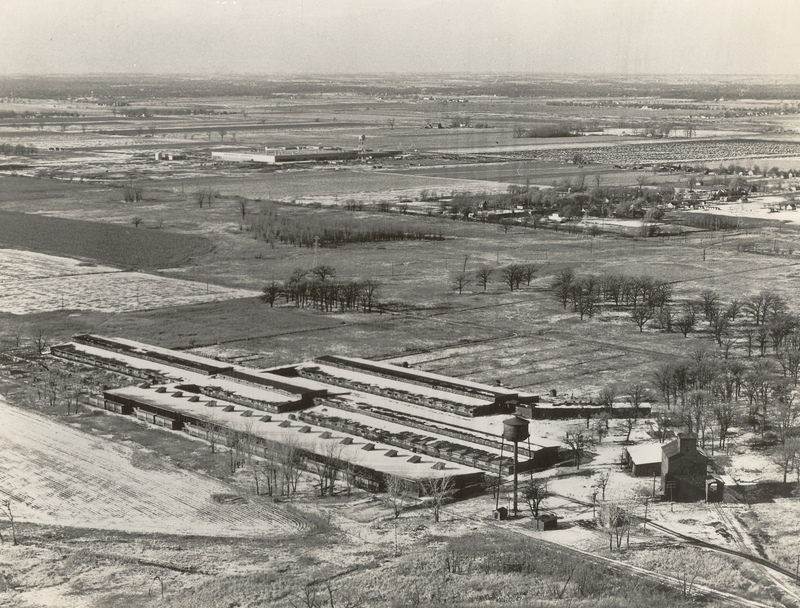 Further industrial development of the southern portion of the old sheep yards in Wayne Township came when the original West Chicago Industries Inc., owners of the 357 acres, had it brought into the city limits by a narrow corridor annexation on December 17, 1956. It was bounded by Hawthorne Lane (formerly Town Line Road), the North Western tracks, the former Chicago Great Western tracks, and a line west of Powis Road. 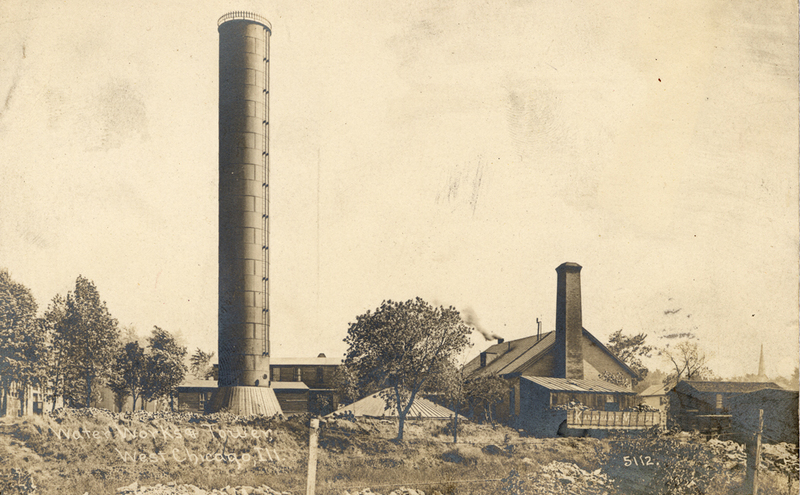 The first industry there, the Du-Kane Asphalt Co., was built on the west side of Powis Road. In January, 1965, more extensive acreage north and west of West Chicago was annexed to the city. 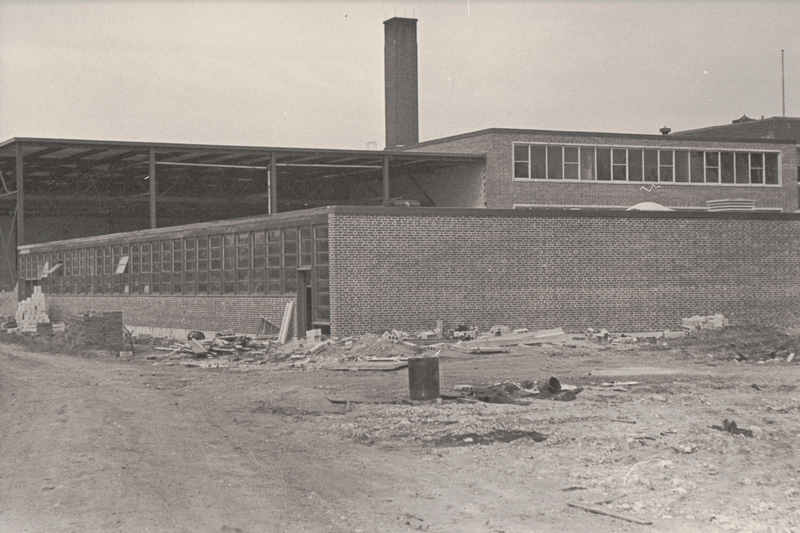 The construction of the first buildings in the renamed West Chicago Industrial Center, a development of the KPK Corp., began in May and June of 1967. 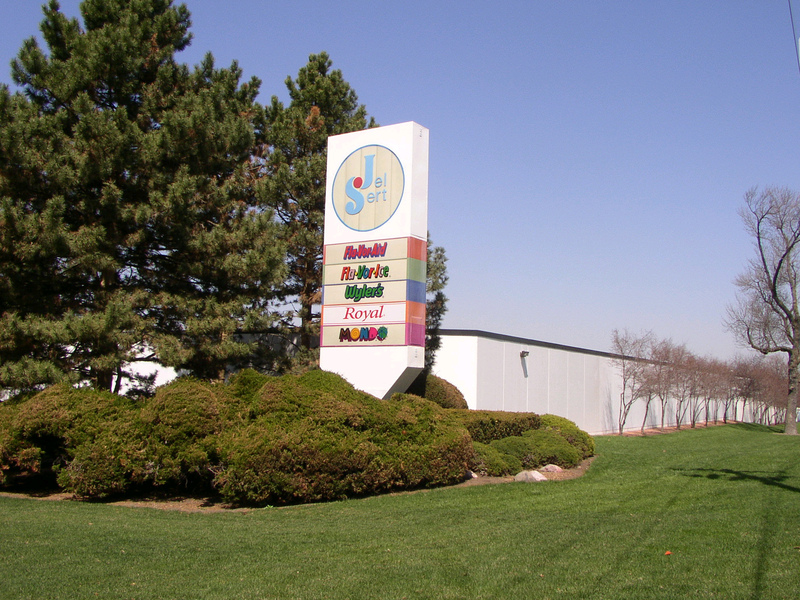 In 1970 the Jel-Sert Co., producer of mixed drinks, purchased the old pickle factory and after extensive remodeling located there. The company also developed some 16 acres into an industrial park, with the South-Western Publishing Co. being the first occupant. West Chicago's industrial growth continues to be strong. The largest industrial areas include the extensive industrial parks in the northwestern and western extremities of the city, including the huge Western Electric plant, as well as the Bowling Green Industrial Park. And other large firms, including General Mills, Northwestern Chemical, Belding Engineering, Bates & Rogers, Geo. J. Ball, Jel-Sert, and Southwestern Publishing, are located throughout the city, while the C&NW's Illinois Division Headquarters are now housed in the area once occupied by the old roundhouse. Next year, West Chicago City Museum will publish Fires, Firemen, and Fire Safety: A History of Firefighting in West Chicago by Martha Joy Noble, to be released October 2019. As far back as 1851, fires and disasters have visited this community, whether it was known as Junction, Turner Junction, Turner or West Chicago. In destroying many old landmarks the flames also consumed historical objects and contents that were irreplaceable. Fire at Junction – The store of Michael McDonald at Junction was destroyed by fire on the night of the 4th. Loss from $700 to $800. Cause of the fire unknown. 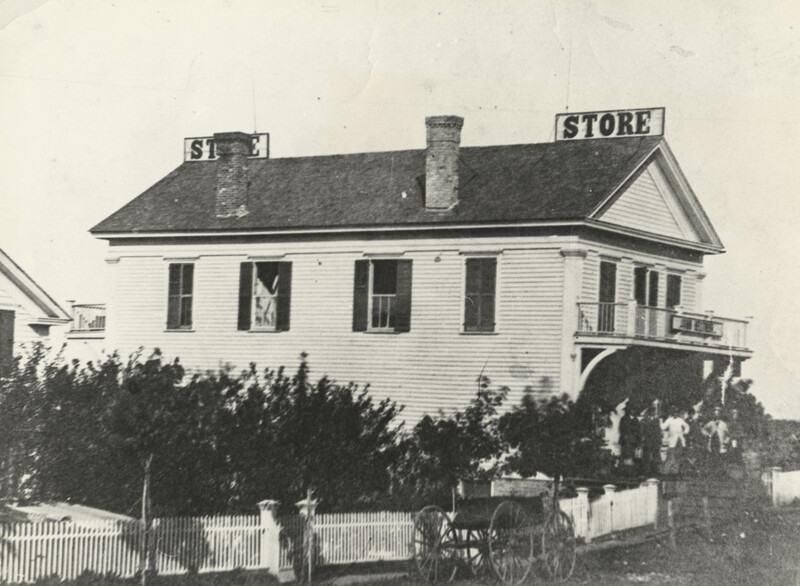 The rebuilt store was sold to Joseph McDonald, a brother, who in turn sold it to Joel Wiant. The site is now occupied by the building at 145 West Washington Street. The Galena and Chicago Union Railroad, which spawned this community, was also responsible for its first major tragedy when the boiler of the steam machine used for sawing wood exploded, killing four railroad employees and injuring several others. The fatal accident occurred on January 27, 1853. Junction at that time was an important wood fueling station until coal-burning locomotives replaced the Galena Road's woodburners. A fire in the late 1860s destroyed the two-story frame building where John C. Neltnor first established his business when he settled here in 1865. After his removal up the street to Voll's Block, a fire in January of 1876 demolished the brick structure containing the businesses of Casper Voll and Neltnor. The records of the Amity Lodge of Masons, who occupied quarters on the second floor, were lost. 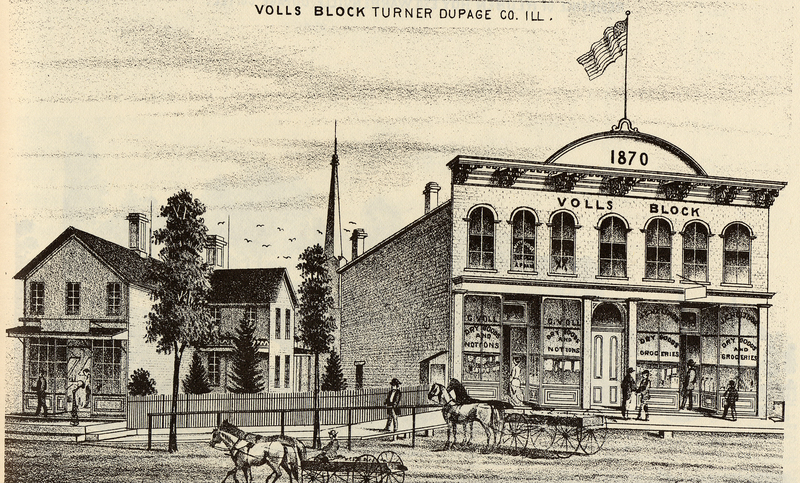 The 1874 Atlas and History of DuPage County includes this illustration of Voll's Block. Note Neltnor's store on the right and Volls' store on the left. In that same year, 1876, and Elgin newspaper reported earlier fires here destroyed a considerable amount of property, but were replaced by new and more elegant, substantial and costly buildings. The early morning conflagration of May 15, 1885, destroyed the rolling mill of the Chicago & North Western. The Extent of the loss was not stated, but the boiler, engine and other valuable machinery were ruined. The mill was rebuilt the same year, but twelve years later on October 5, 1897, the newly-organized volunteer fire department fought their first major fire when the rolling mill had another blaze of unknown origin. Then on November 17, 1899, a fatal boiler explosion killed one man, crippled another for life, and injured two others. After this tragedy the rolling mill was never rebuilt. Late in April, 1889, the butter and cheese factory burned to the ground. 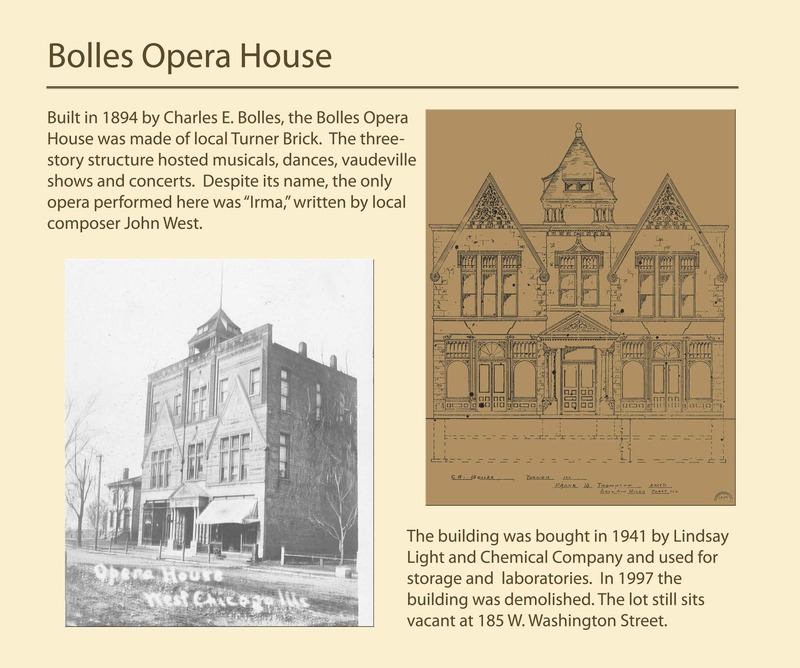 It was located in the vicinity of Joliet and Conde Streets. A co-operative creamery, built a few months later off Geneva and Town Roads met a similar fate in an unknown year. On August 11, 1894, the business section of Turner had a narrow escape from total destruction by a conflagration whose origin was long disputed. 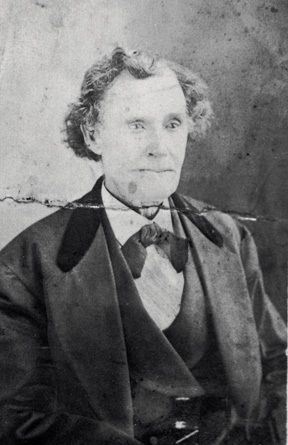 The $7,000 fire burned down Mrs. Briggs' two-story frame boarding house, another building of similar construction occupied as a shoe store and residence, and a one-story building in which S. B. Grimes conducted his barber business. The three buildings stood between the Town Hall and Fessler's structure; both high brick buildings acted as firewalls. 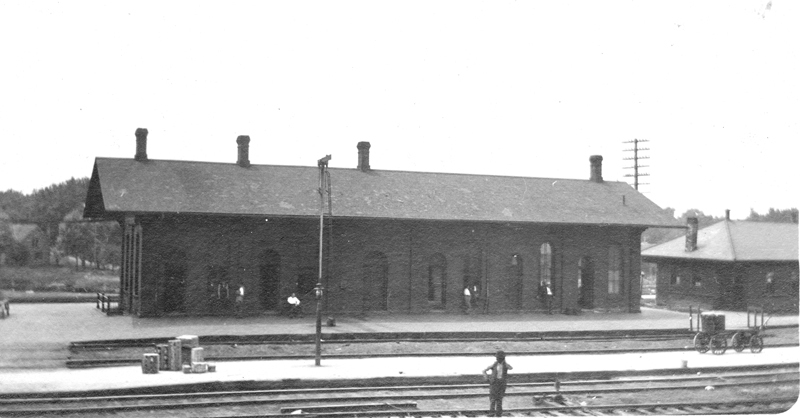 Three days later on August 7, the first depot here of the Elgin, Joliet & Eastern Railway went up in flames when a supposed spark from a passing engine lodged under the floor of the $1,500 frame station. The wind and flames did other damage in the surrounding area. The Main Street fire brought about a month later the passage of an ordinance prohibiting the construction of any wooden buildings on today's Main and Washington Streets. A railroad wreck occurring here on June 30, 1897, killed three persons and injured 21 others, and is considered the community's worst railroad accident. One section of the North Western's Overland Limited, while pulling out after stopping here for water, was run into by another section of the Overland Limited, running a few minutes apart. Both trains were carrying excursionists who were members of the Christian Endeavor Society bound for their annual convention in San Francisco. The litigation that followed was a costly one to the North Western. Another fire which threatened the business portion of the village began on the afternoon of September 7, 1904, on the east side of Main Street, when E. S. Standidge's livery stable was consumed by the flames, killing a number of horses. The fire spread to the adjoining Odd Fellows building, Springer & Rohr's merchandise and grocery store, and the offices of Lawyer Burton Jones and Dr. Thomas Isherwood. The Gridley & Goetz hardware store and Donavin's blacksmith shop also sustained fire damage. This $10,000 fire had an unusual aspect. The local fire fighters appealed to the Wheaton fire department, and at the time the call was received a way freight had stopped at Wheaton and a fire apparatus and men were put on and sent here, arriving in time to control a fire fanned by a brisk breeze. Almost a year later, on July 5, 1905, the Standidge livery stable, now moved to its new location on the corner of Main and Washington, had another blaze and again the business section was threatened with possible destruction. On August 12, 1906, an estimated $4,000 fire completely destroyed the barn owned by E. E. Belding, the house mover. The loss was quite a serious one, as the barn contained implements used in the house-moving business. Then on August 17, five days later, a $40,000 fire practically destroyed the factory buildings of the Chicago Crossing Company, manufacturers of railroad crossings, located on Factory Street. The adjoining plant of the Chicago Heater Company escaped destruction. A destructive conflagration, causing damages from $50,000 to $60,000, occurred on October 15, 1910, when the large frame factory building of the Turner Cabinet Company was burned down. For a while the fire threatened to destroy the entire city, despite the heroic efforts of volunteer firemen. The company manufactured post office fixtures and other office equipment, and a patent post office lock. Machinery, valued at $18,000, was destroyed, and the fire swept the company out of existence. When the city pumping station and only source of water, directly opposite the burning factory, caught fire three times in succession, it was thought the business portion of West Chicago was doomed. But the engines were kept working in the burning station until the fire was out, when a shut down was ordered for needed repairs. Destroyed also was the home of W. H. S. Moore, the company president, and every window on the south side of the new high school building – Washington School – was broken by the heat. 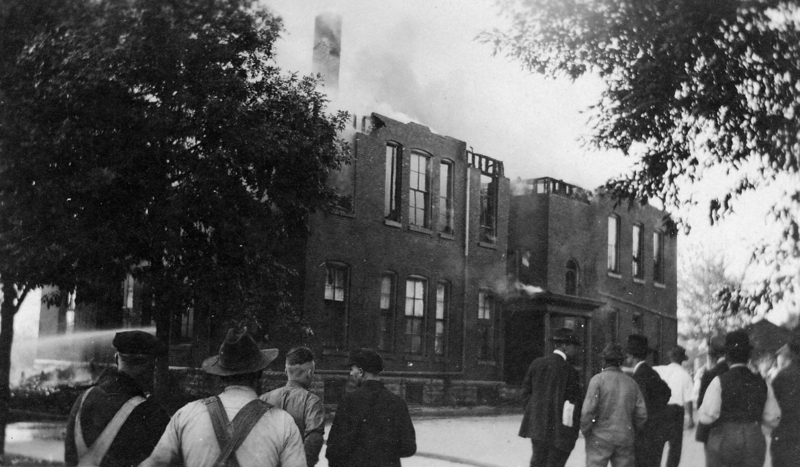 The South Side School, built in 1887, was destroyed by a fire on September 25, 1919, John P. Raap of Joliet Street, who fought the blaze as a fireman, recalls that only the brick walls were left standing. A diarist for that year wrote: “The fire whistle blew about 10:30 (recess time), and the South Side School building burned to the ground; no one was hurt.” It was later claimed a passing freight train blocked the fire department at the Washington Street crossing and the delay put the fire beyond control. The North Western Railroad coal chutes and bins in the west end yards were struck by lightning in 1920 and the fire caused a $80,000 loss to the railroad company. Other fires occurring in that period were at the Bates & Rogers Construction location and the Children's Convalescent Home on Prince Crossing Road. Fires of recent memory occurred at the Northwestern Chemical Company, where an explosion and fire caused considerable damage, and at the North Western roundhouse, where the brick structure of ancient vintage was destroyed. The Star Center Bowling Lanes and Restaurant on Roosevelt Road and Ray Roberts Steak House on Route 59 and Gary's Mill Road also became fire victims. A fire destroyed the American Legion Home, the former remodeled Roxy Theater, and the Historic stone building which housed the first bank here, and another venerable landmark, the Neltnor-Anthony mansion, at 59 and Washington, succumbed to night flames. The West Chicago Stock Yards, located on the western outskirts of the city, and built by the Chicago & North Western Railway back in 1929 and abandoned in 1964, were consumed by spectacular fires a few days apart in 1971. 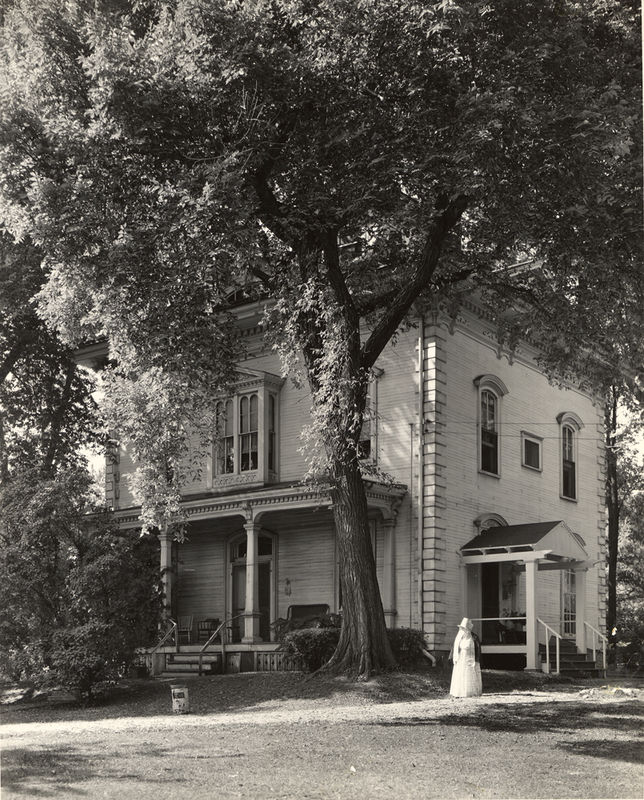 John C. Neltnor had this three-story Italianate home built in 1869. He and wife Mary raised their family of seven children at what Neltnor dubbed “Grove Place.” Grove Place was home to the Neltnor family for almost a century. In January of 1966, a fire gutted the structure and in September of 1967 it was razed. The Egg Yolk Cafe now occupies its site. The costly fires in 1971 at Carriage Woods (Aspen Ridge) apartment complex at 1440 S. Neltnor; the Jan. 14, 1972 fire at Liquid Container Corp. which completely destroyed the plant at 901 Factory Street with a loss of $750,000; the early morning blaze on June 29, 1976 also destroyed Eddie's Restaurant and Lounge on West and Washington; and the fire on April 12, 1977 which caused a $100,000 loss at the General Mills plant, W. Washington and Town Road – close, for the present, West Chicago's fire record since 1851.